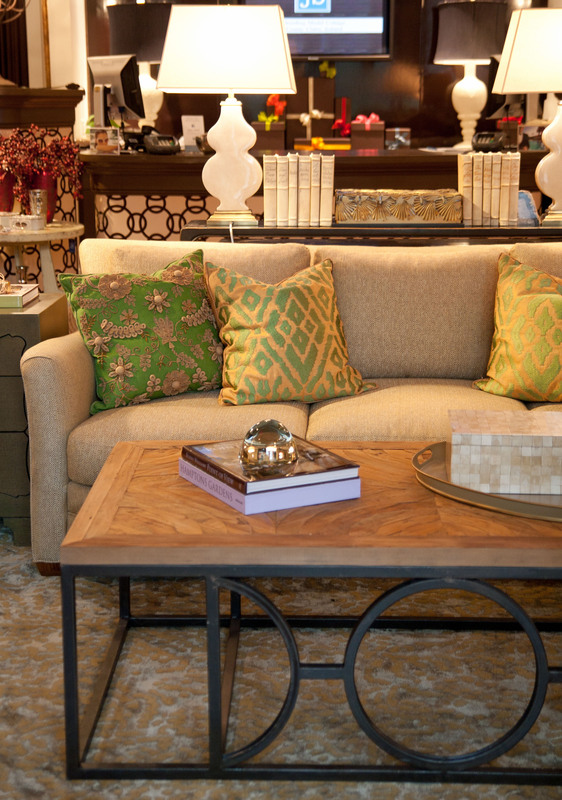 We took one sofa in our retail store and asked each of the J Banks Designers to style the sofa and surrounding space utilizing pillows, lamps and accessories. 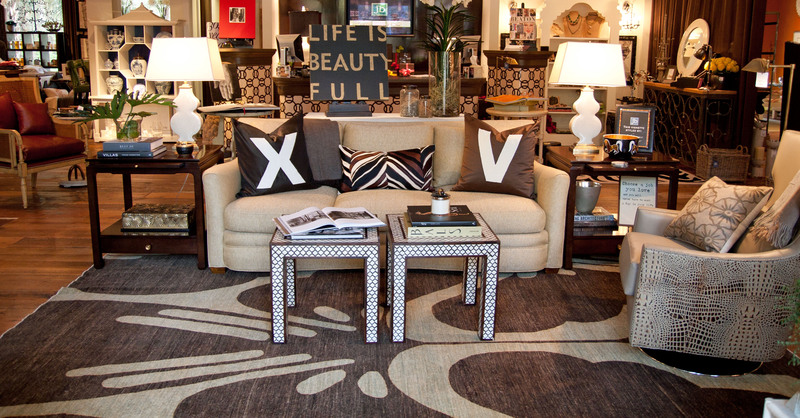 Each Designer had the ability to create a space that not only showed their “of-the-moment” loves from our retail store, but also demonstrated how a design client can easily change a space by adding a few new elements. 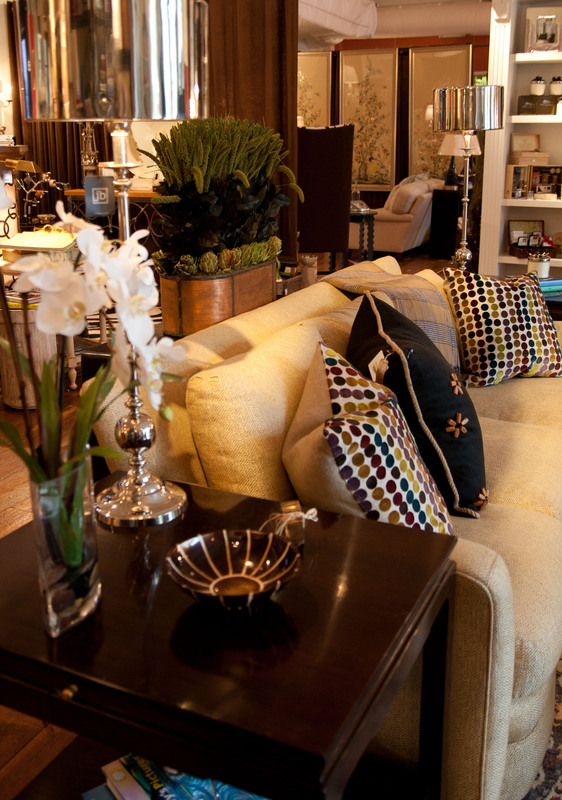 Every week a different Designer would style the space and the results were always unique. Below is an image of each design. Thank you to everyone who participated and helped with this project! 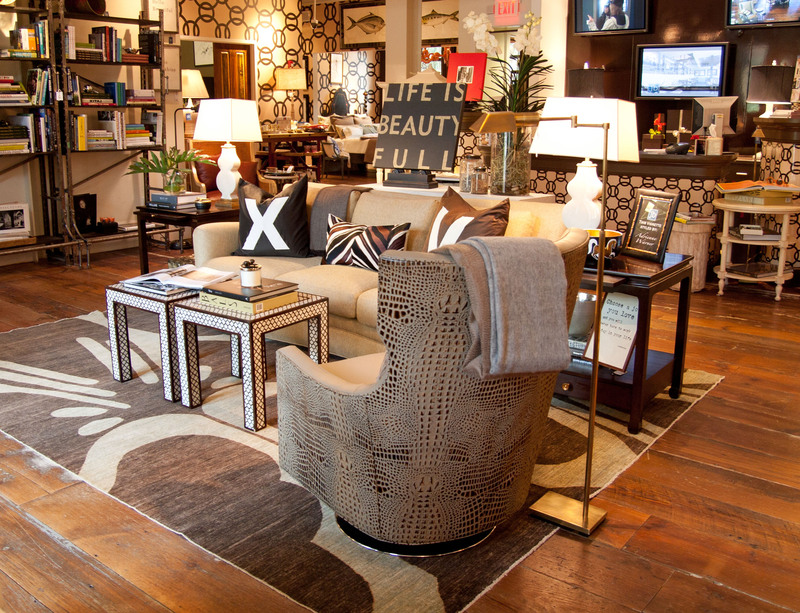 It was fun seeing the same space interpreted through each different designer’s eyes. If you’d like to purchase or receive additional information on any of these featured products, please feel free to stop by or contact our retail store at 843.682.1745. Thank you to KPM Flooring for donating the beautiful rugs that were used each week. 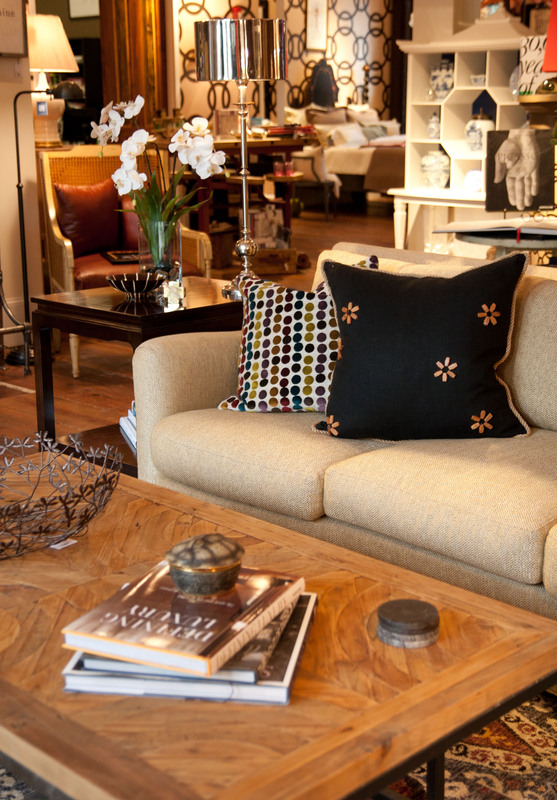 In case you have missed our previous posts on the white sofa project, here is a quick update. 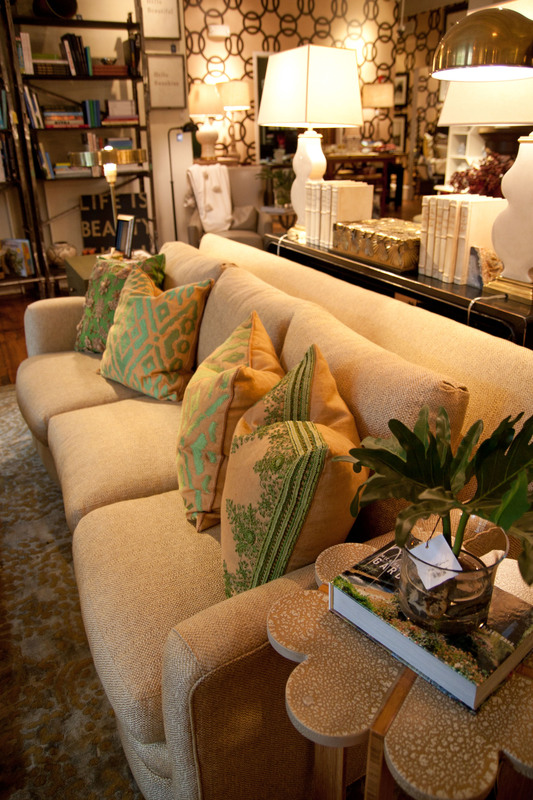 We have taken one sofa in our retail store and have asked each of the J Banks Designers to style the sofa and surrounding space utilizing pillows, lamps and accessories. 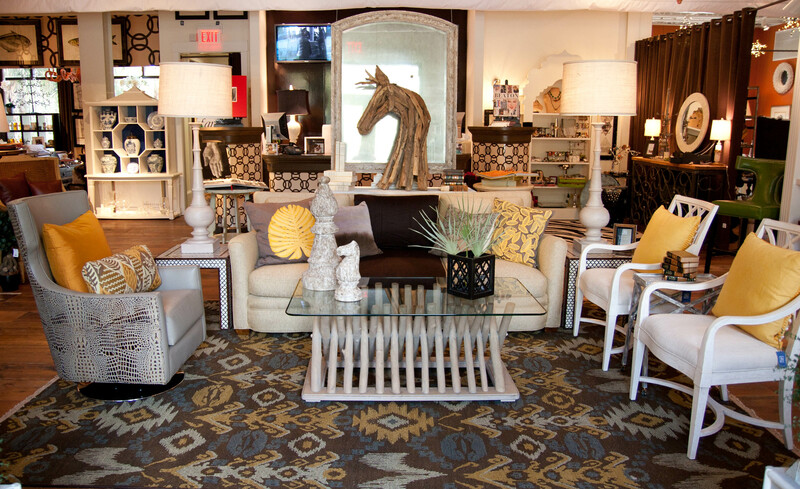 Each designer has the ability to create a space that shows off their “of-the-moment” loves from our retail store as well as how a design client can easily change a space by adding a few new elements. Enjoy our most recent transformation! 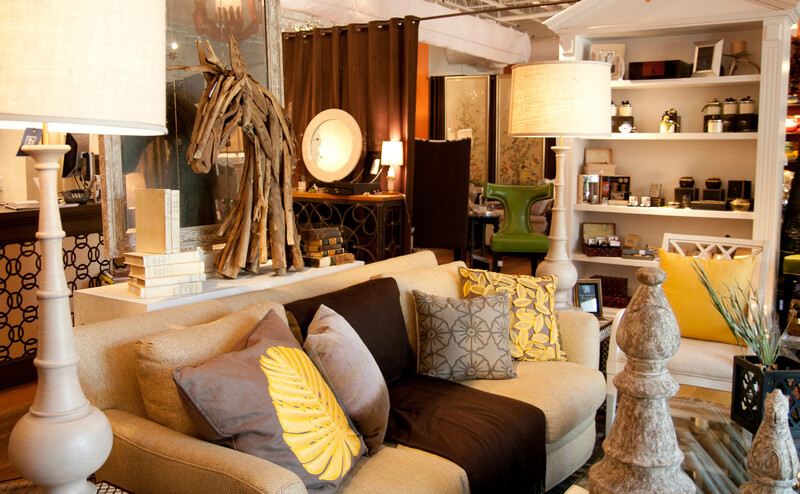 JB: What is your favorite item or items in the vignette? Why? 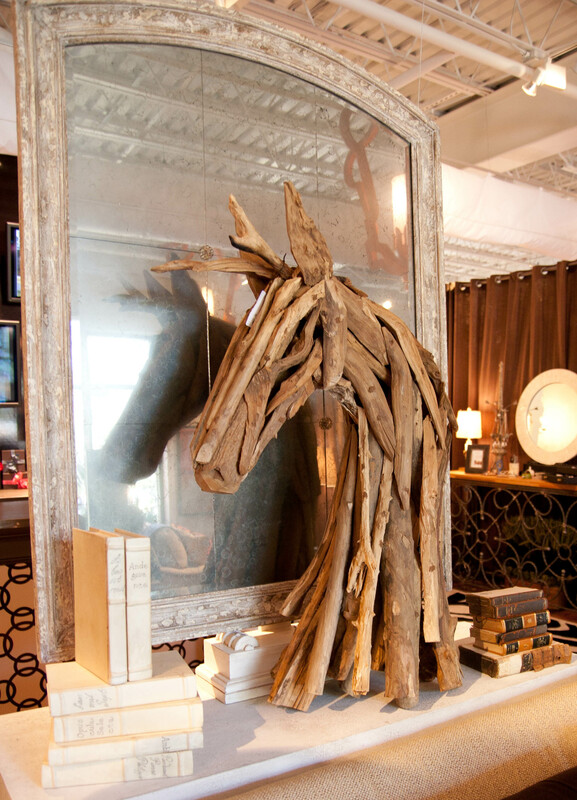 Sharon: My favorite item in the vignette is absolutely the distressed antiqued mirror. 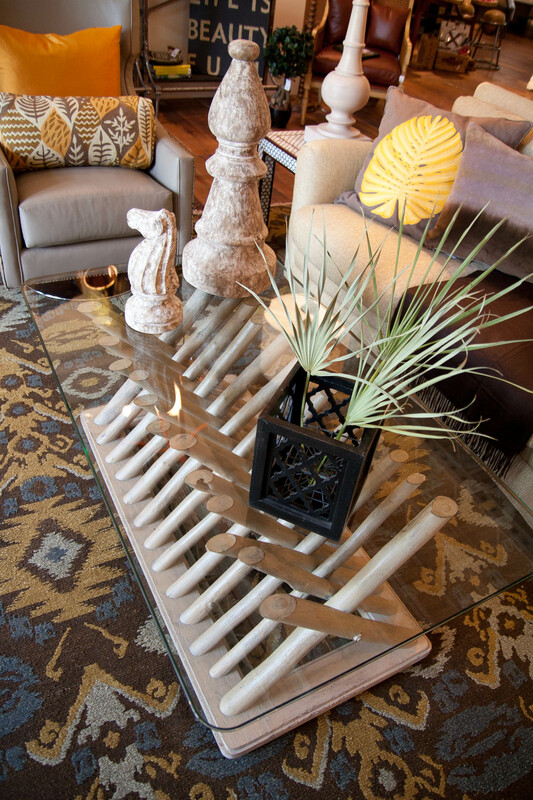 I love to use mirrors in living spaces as they instantly add depth to the room, and, not only do they bounce light into the space, but also reflect the image of whatever is on the opposite side of the room. I like to think of mirrors as “windows” and especially am drawn to “antiqued” glass to add character and patina to the space. JB: Tell us a little bit about your color choices. 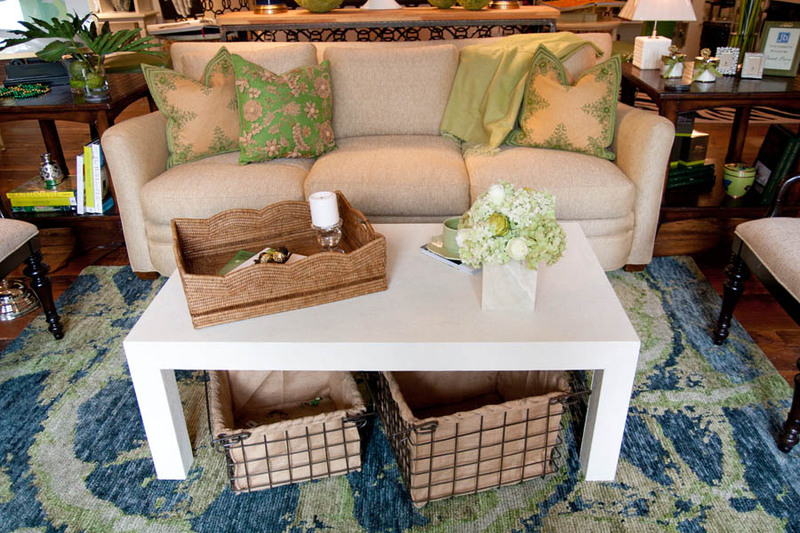 Sharon: I am a real fan of “neutral” color choices for main upholstery pieces, but like to ‘anchor’ the look with a contrasting rug and accessorize with color. 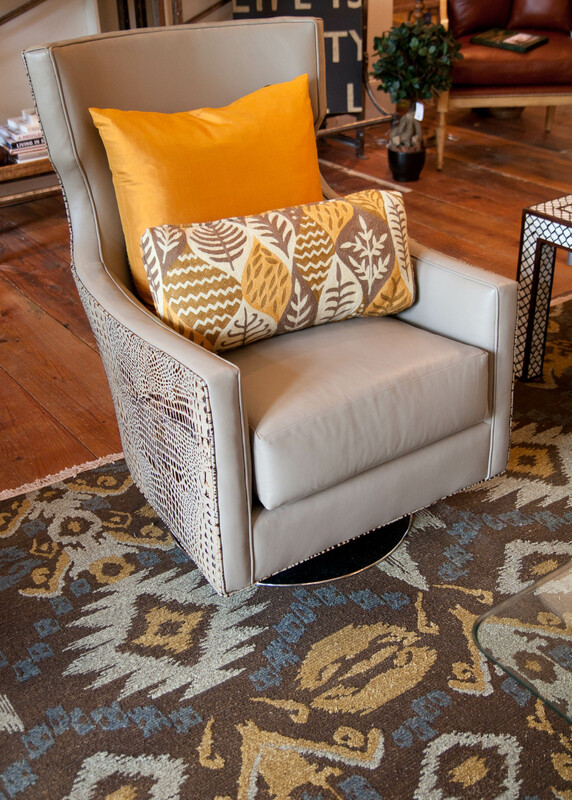 I fell in love with this 100% wool Soumak weave Indian rug and used the colors from the rug to pull pillows in a marigold shade with accent colors of taupe and slate. 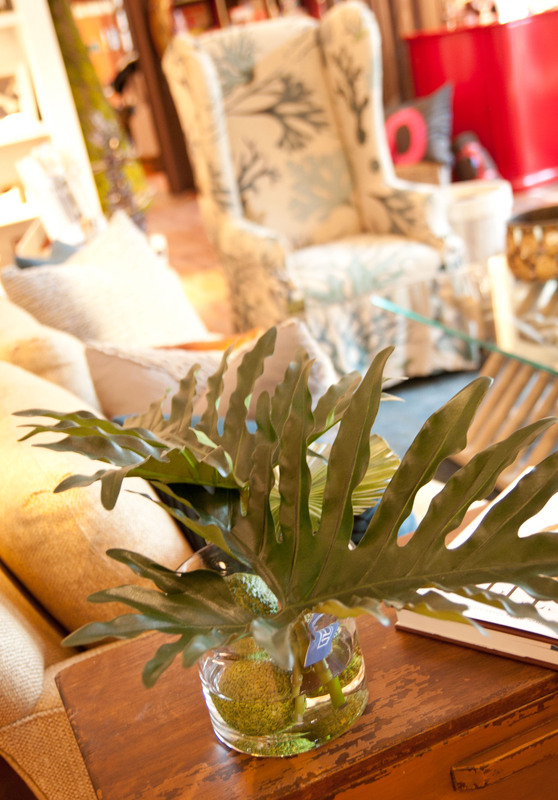 Since moving to this sub tropical climate last year from the cooler shores of Ireland, I am thrilled to introduce sharp fun colors and tropical greenery to interior schemes to reflect the lush outdoors. JB: What advice about accessories do you give your clients? 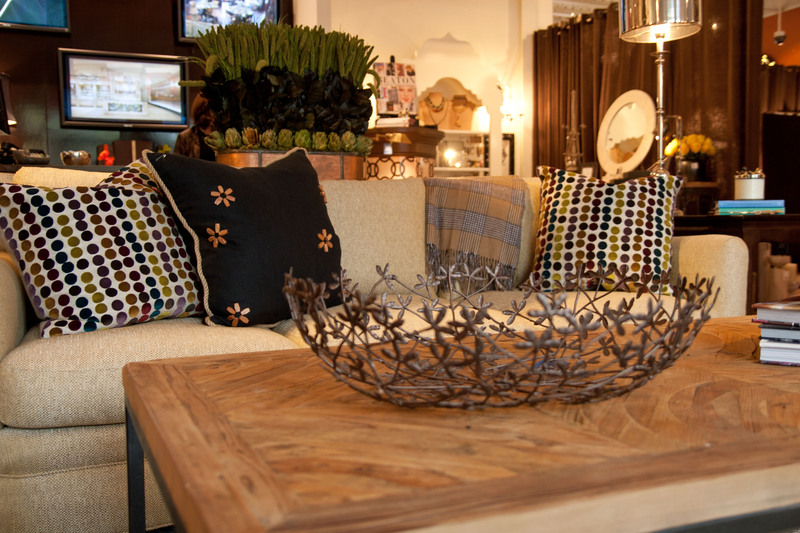 Sharon: Accessories will make or break an interior scheme. 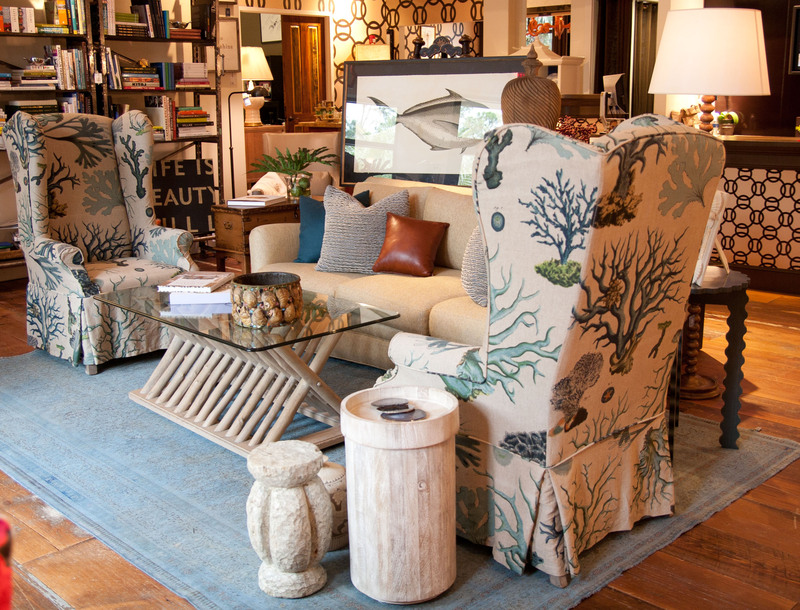 I LOVE fewer over-scaled statement pieces as opposed to lots of small pieces. 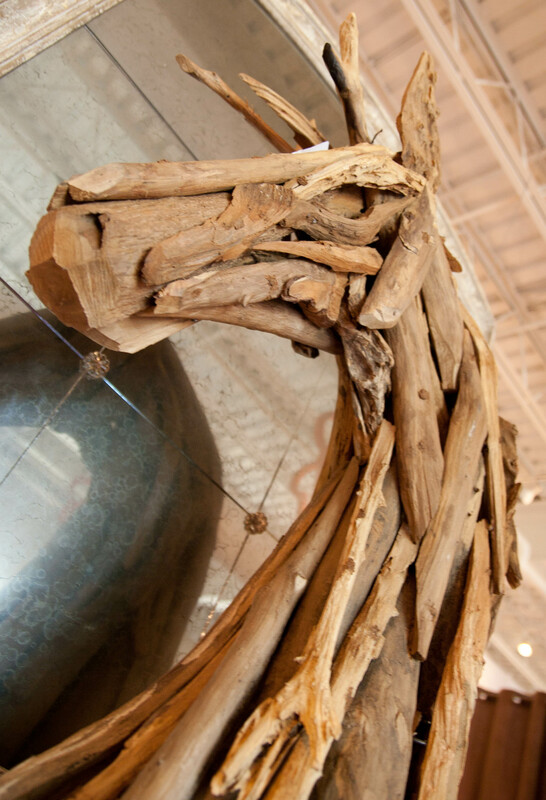 I chose a less predictable casual beachy theme incorporating aged driftwood finishes in the cocktail table, and the statement accessory being the driftwood horse head sculpture which has added impact being reflected in the mirror. 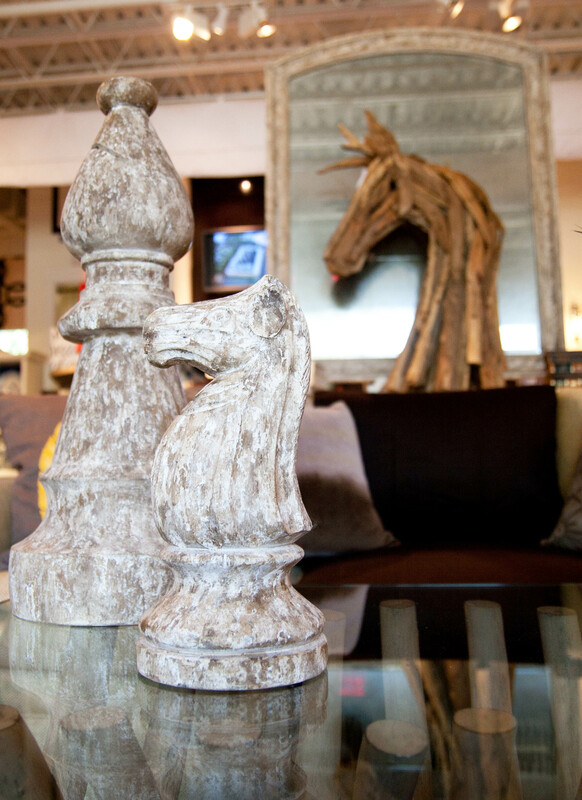 The symmetrical overscaled lamps add drama and balance, and the horse theme repetition is echoed in the chess piece on the cocktail table. 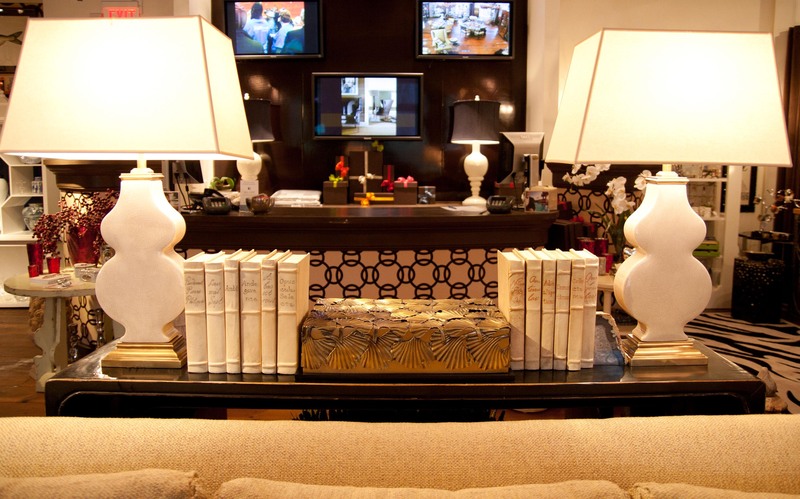 I collect old hard back books and incorporated them everywhere to add height and interest. JB: What did you want the overall mood of the space to be? 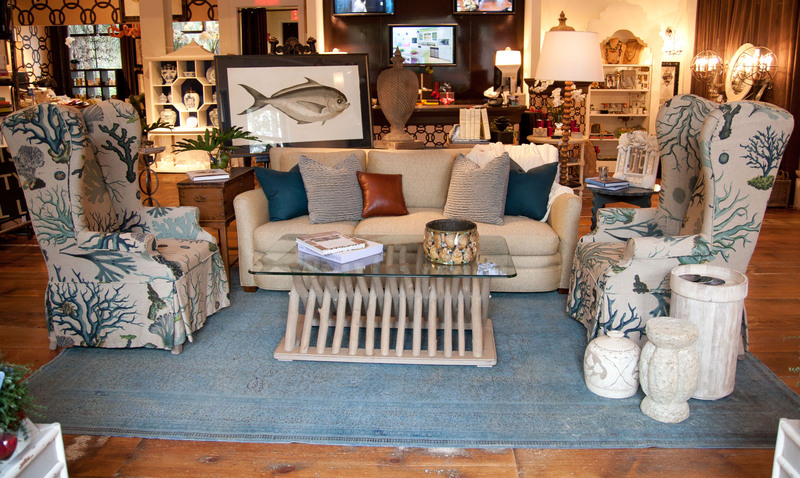 Sharon: The mood I tried to create here is one of eclectic casual with a tropical flavor! Keep following our blog to see more designer interpretations and check out our previous white sofa designs by Deb Van Plew, Hannah Fulton, Cindy Munn , Adrienne Warner, Shelley Wilkins , Patche Pratt, Janet Perry and Lisa Whitley. If you’d like to purchase or receive additional information on any of these featured products, please feel free to stop by or contact our retail store at 843.682.1745. JB: You obviously went with a sophisticated St. Patrick’s day theme but is green a color you like to use in a lot of your work? Janet: I love to use green. Just look outside! 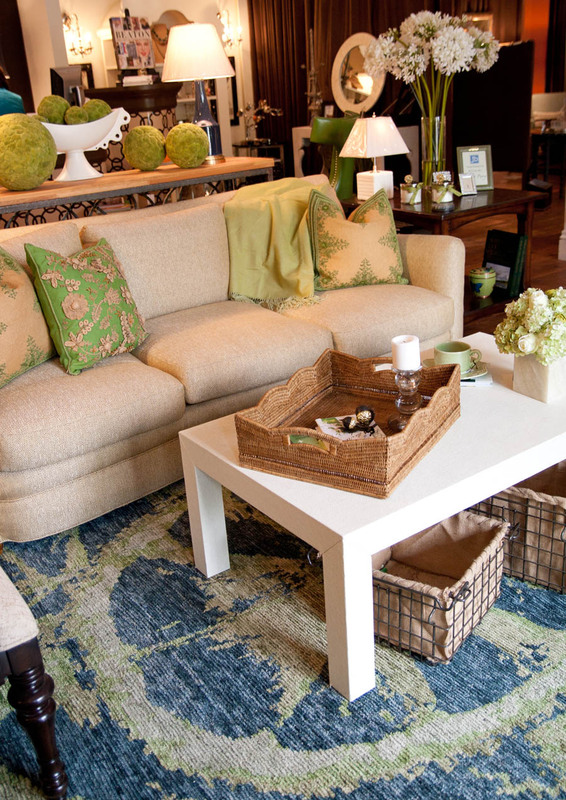 We are seeing this hue of green in fabrics and in fashion. 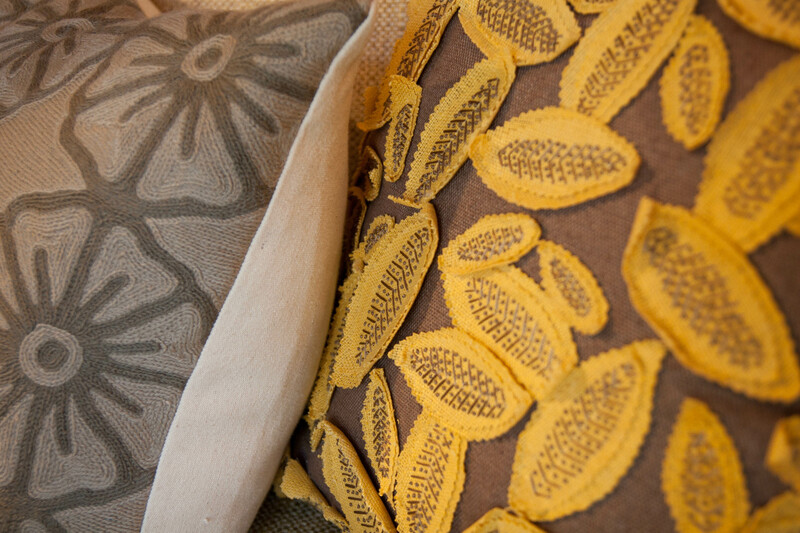 We love the gorgeous detail on these pillows! 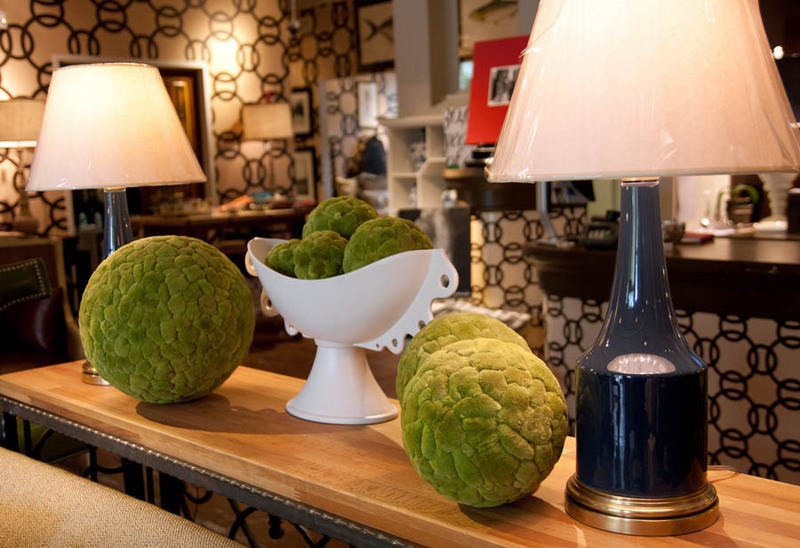 What a great way to incorporate navy into the vignette through the lamps. 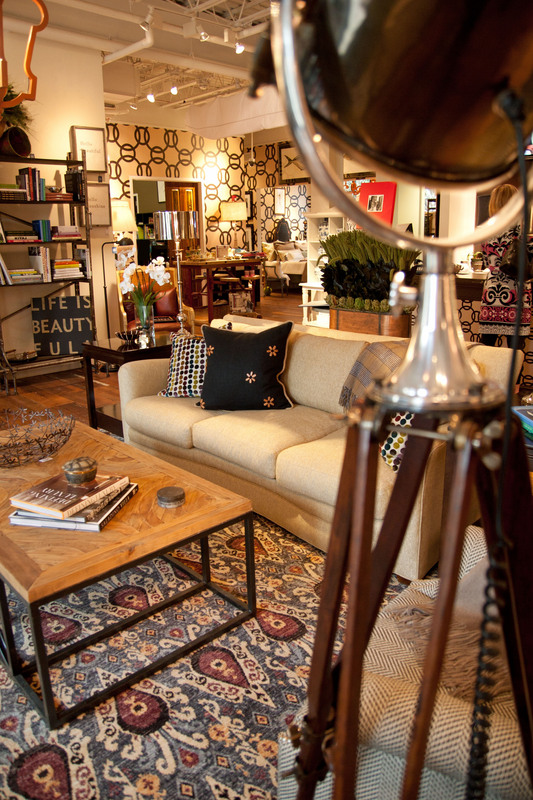 JB: What is important to you when selecting accessories for a space? 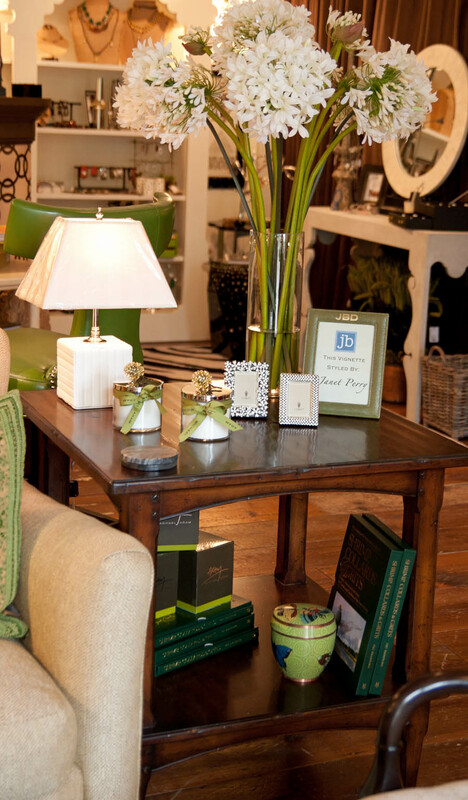 Janet: It is important to have the accessories compliment the space as well as being practical and useful, i.e., lamps, frames for photographs, candles for soft light, etc. JB: You did an excellent job of mixing different wood colors and finishes on your case goods, yet the room still looks uniform and put together. 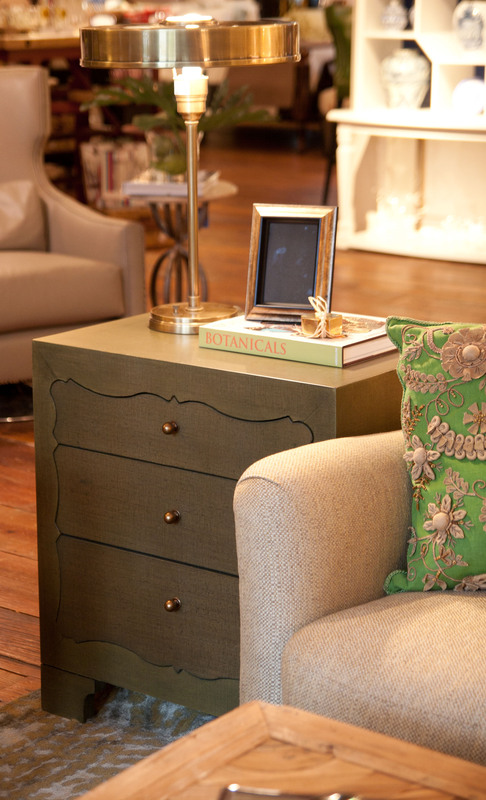 Do you have any advice to others on how to do this with their own furnishings? 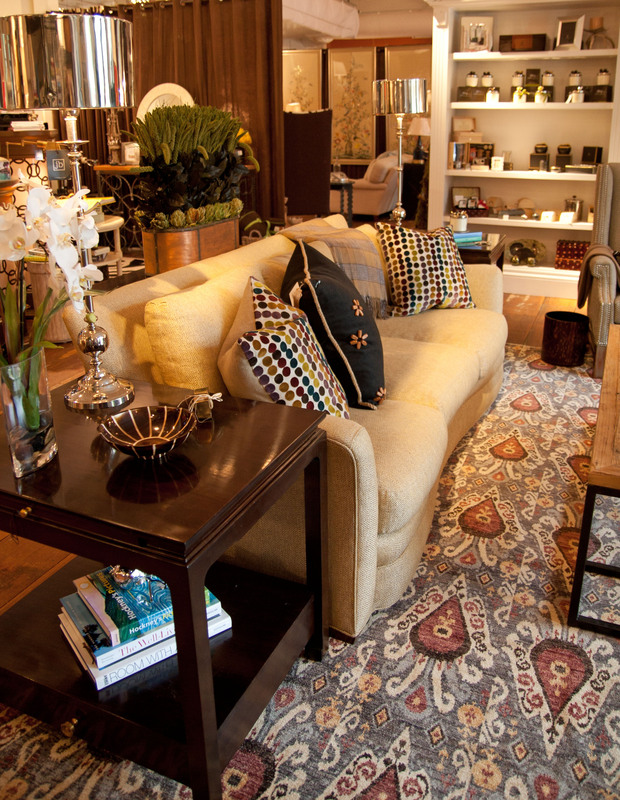 Janet: I prefer the eclectic feel to a room. 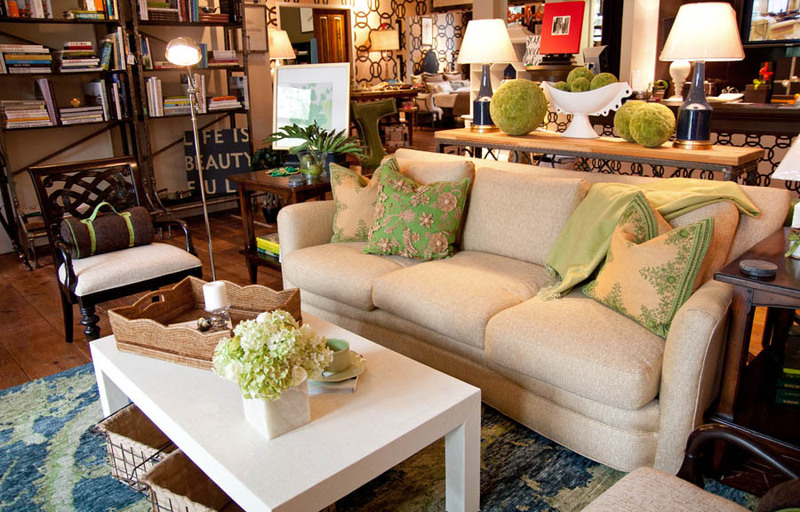 Items have been collected over the years, so taste and lifestyles have changed. So mix your treasures, and “tell” your story. 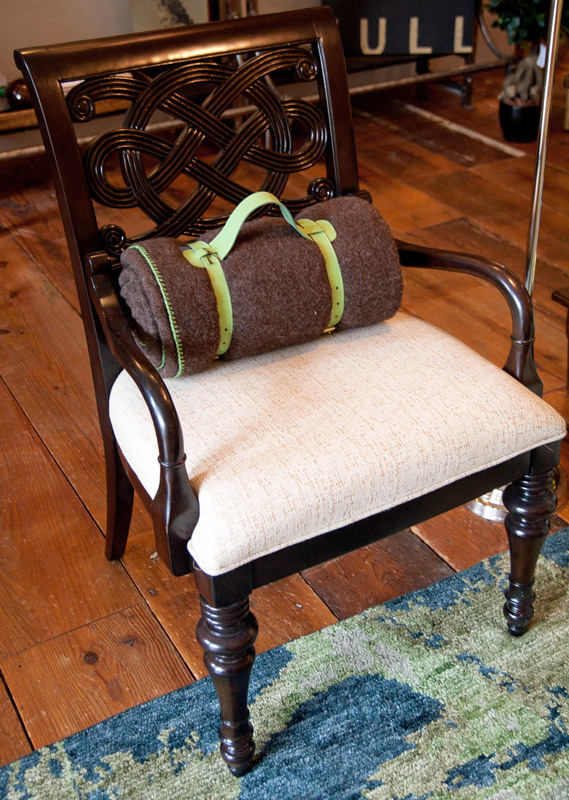 Using rolled blanket as a bolster – so clever! 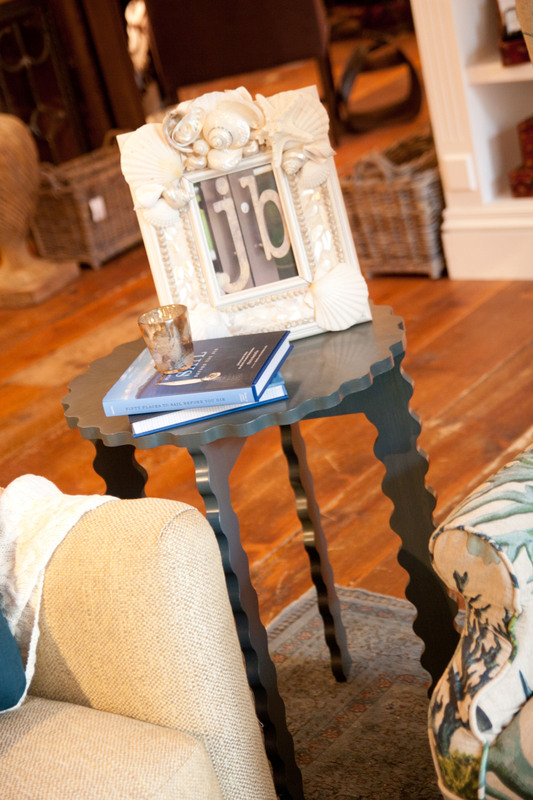 JB: What is your favorite item or items in the vignette? 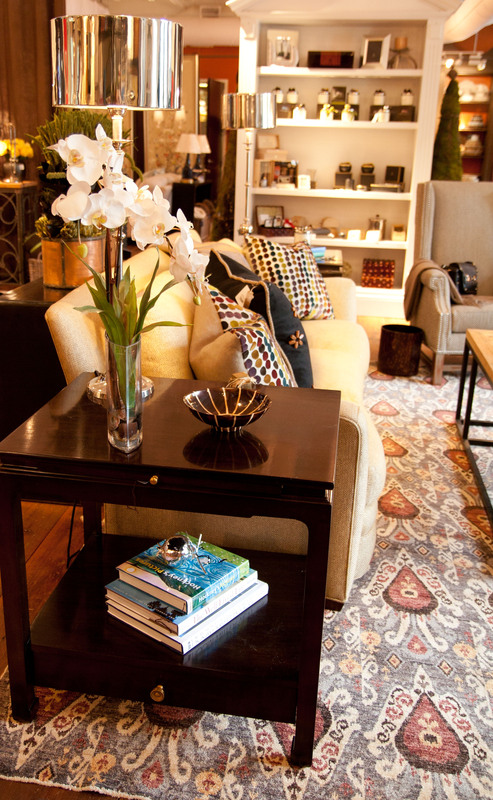 Janet: The rug is where it all began! Keep following our blog to see more designer interpretations and check out our previous white sofa designs by Deb Van Plew, Hannah Fulton ,Cindy Munn , Adrienne Warner, Shelley Wilkins and Patche Pratt. 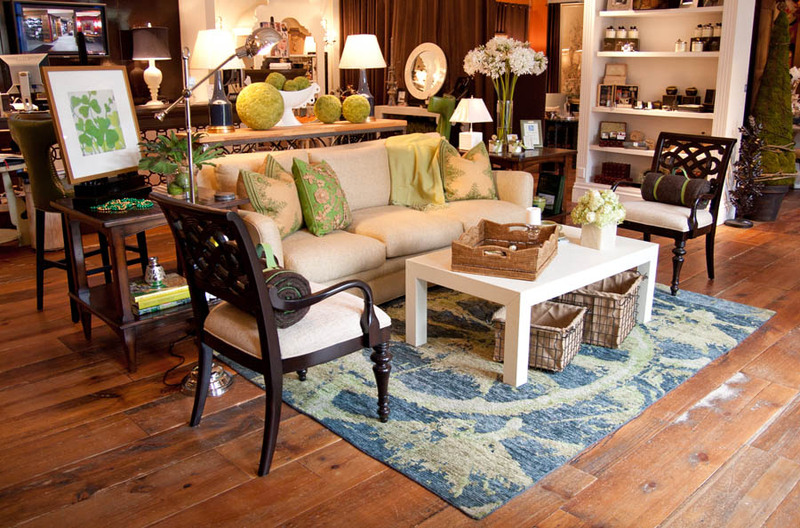 JB: The rug you selected is stunning. 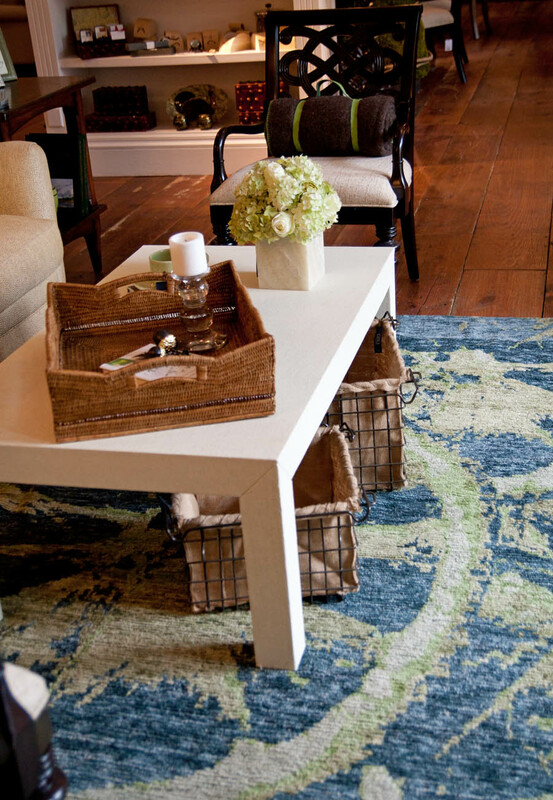 What can you tell us about your rug choice? 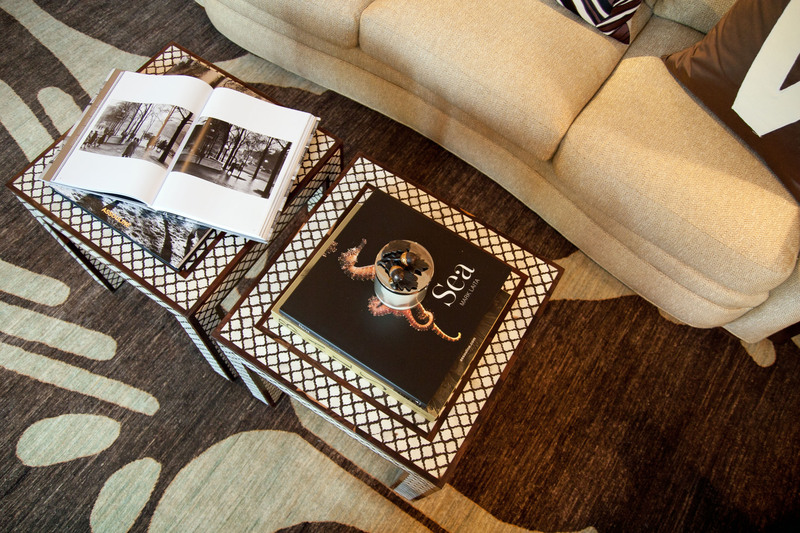 Patche: I chose the rug for two reasons: I wanted a warm and cozy feel for one, and with the neutral sofa and wood floors as the background, I wanted a graphic pattern to add interest to the space. 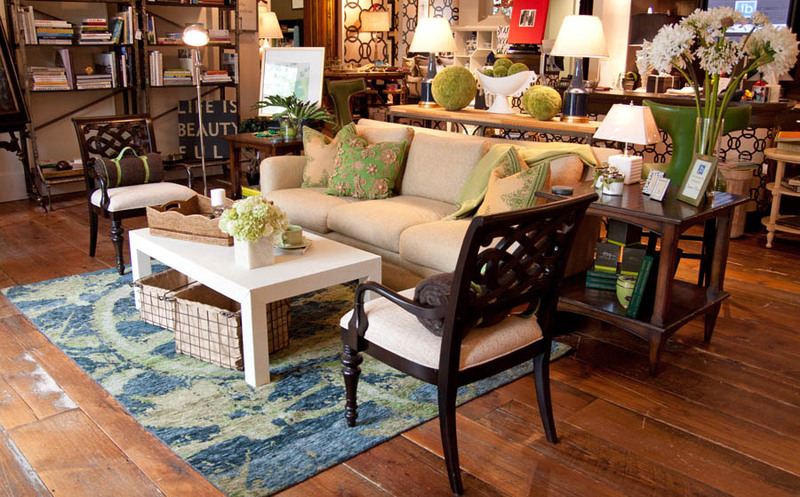 The color palette has a washed or muted feel so it wasn’t too bold to take away from the coziness. JB: What about your color choices? Patche: I have always been drawn to varied shades of red in combination with black and or brown. 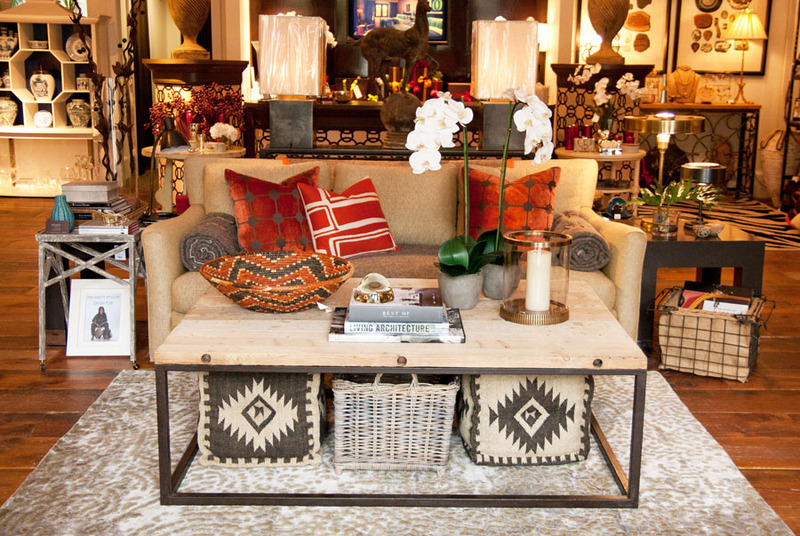 This gave me the inspiration and direction in selecting the patterned pair of throw pillows that pulls colors from the rug and adds pattern to the sofa. 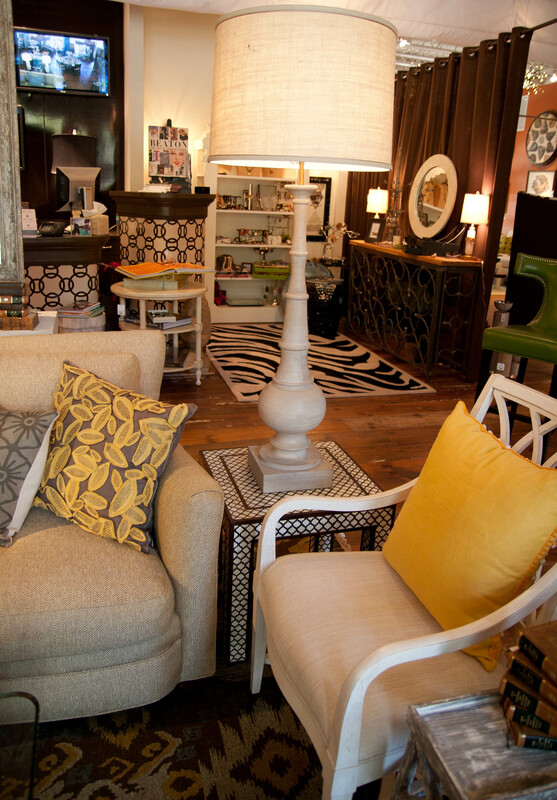 JB: What is important to consider when selecting lighting choices? 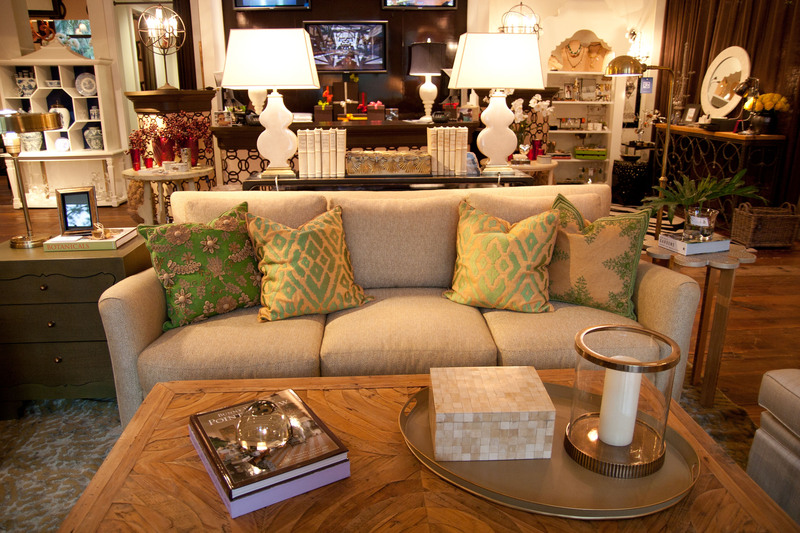 Patche: When choosing lighting or lamps you need to consider the use for the space. 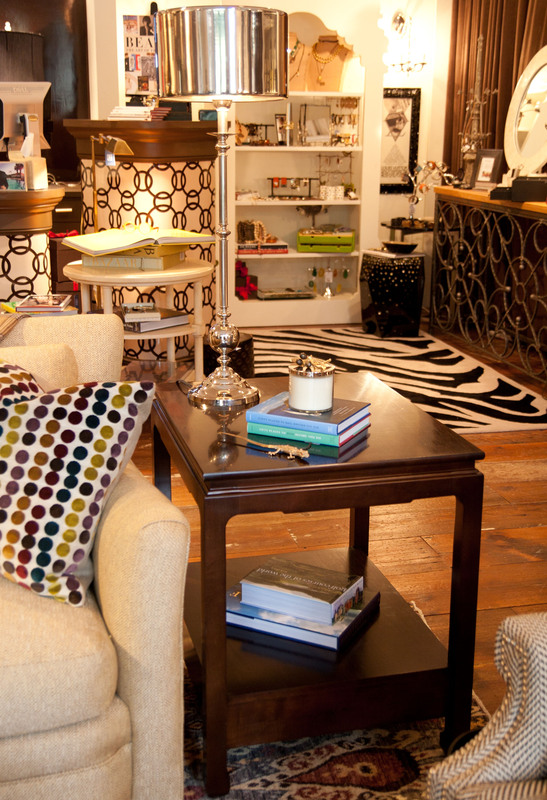 If it is for ambient lighting you can go with lower wattage and dark or metal shades. If it is for reading and you don’t have sufficient over head lighting, you should go with a three way lamp and a lighter shade color. 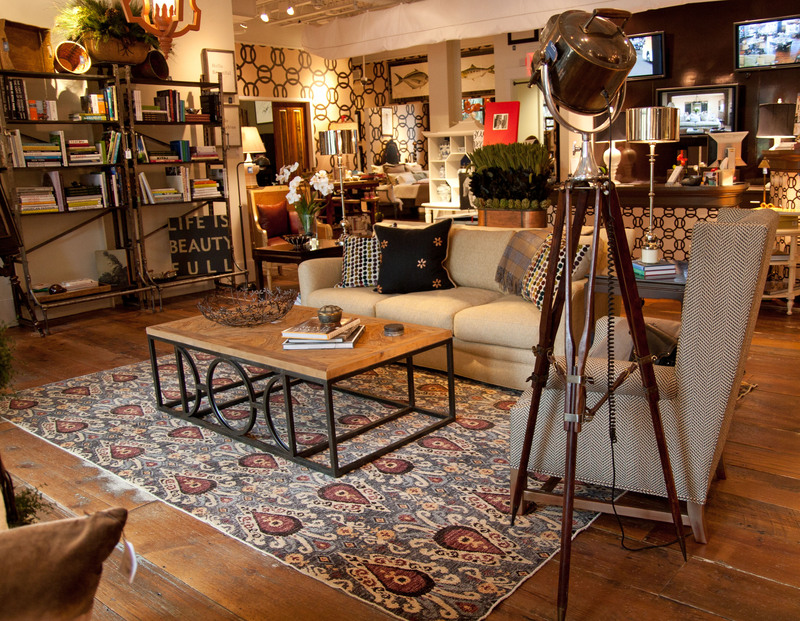 JB: What did you like about the particular lamps selected? 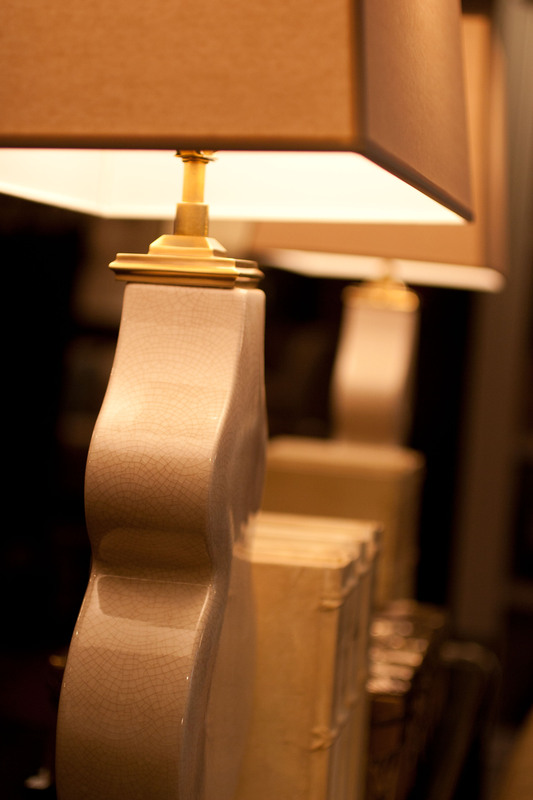 Patche: I chose a pair of polished nickel lamps for several reasons. I love the reflective quality in the finish, and it adds brightness to the vignette. By using a pair, it also gives the space symmetry and balance. JB: What advice do you give your clients about picking accessories? 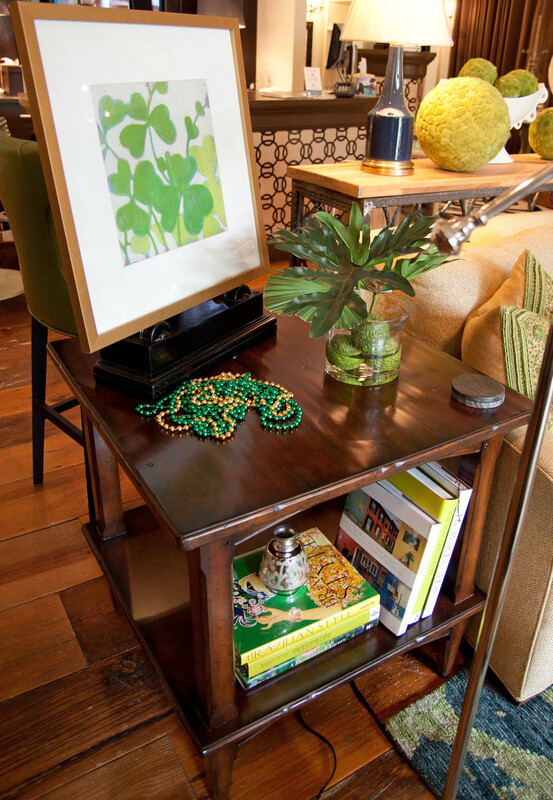 Patche: I like mixing materials not only in accessories, but also with casegood pieces (cocktail tables, end tables, etc…). 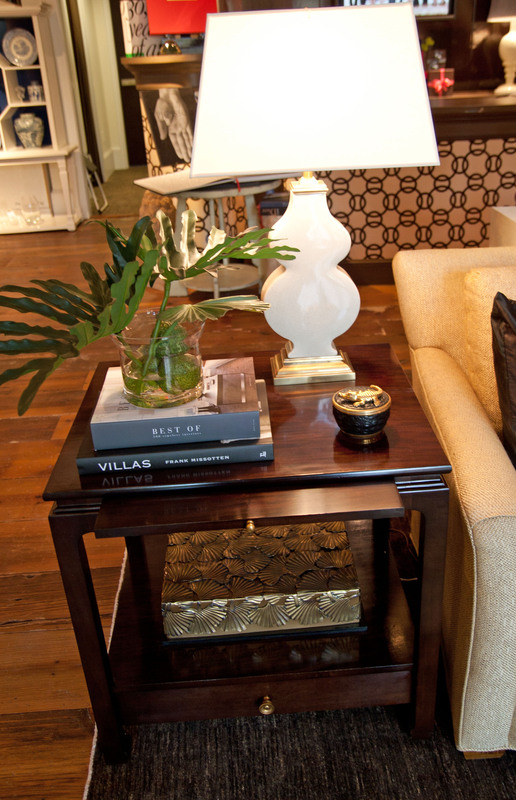 In my vignette I paired dark wood end tables with polished nickel lamps. 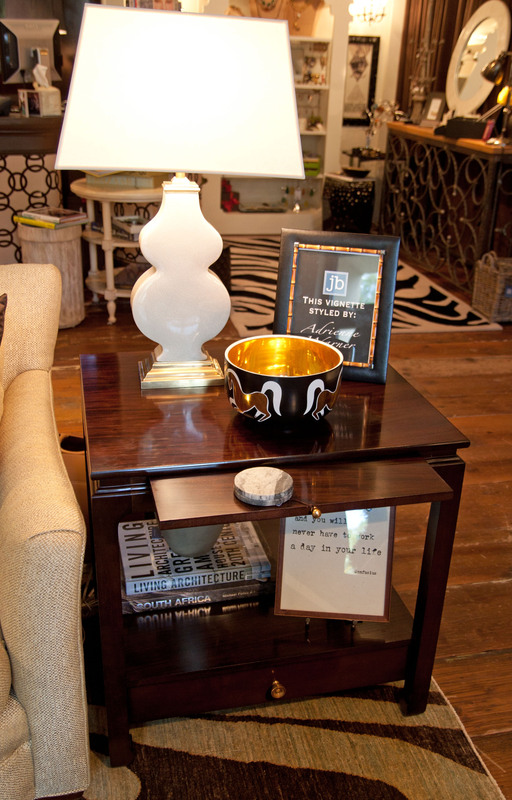 I also chose a glass vase with bright white orchids to serve as a contrast against the darkly stained wood. 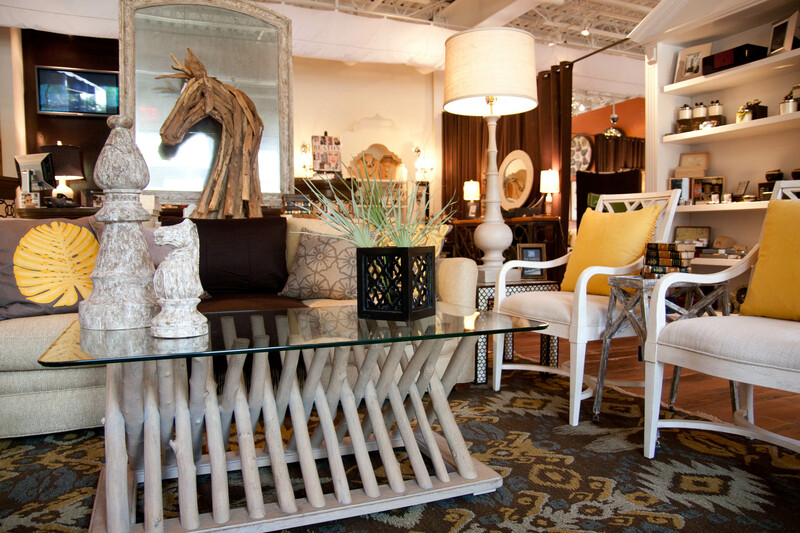 The cocktail table has mixed materials as well – a rustic driftwood top and a metal base – and serves as a great juxtaposition to the refined and formal finish of the end tables. Scale is also important. 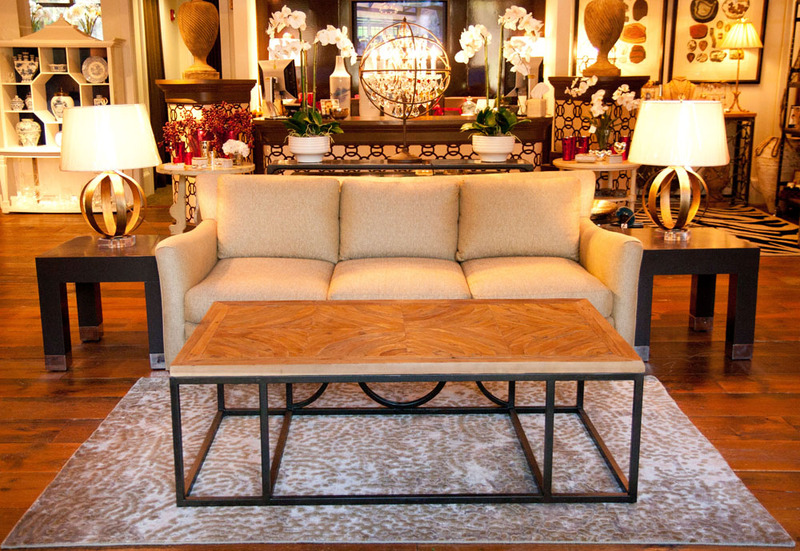 The large cocktail table anchors the space and doesn’t get lost against the strongly patterned rug. 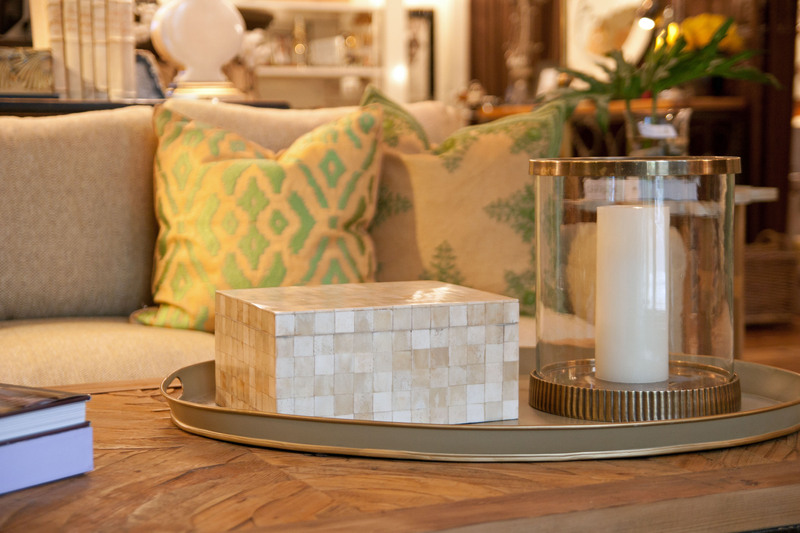 I am a “less is more” person so I feel that a few great cocktail table books and an interesting object (like a great decorative bowl) are all you need to accessorize a cocktail table. JB: Is there anything else you would like to add? Your favorite pieces in the vignette, etc.? 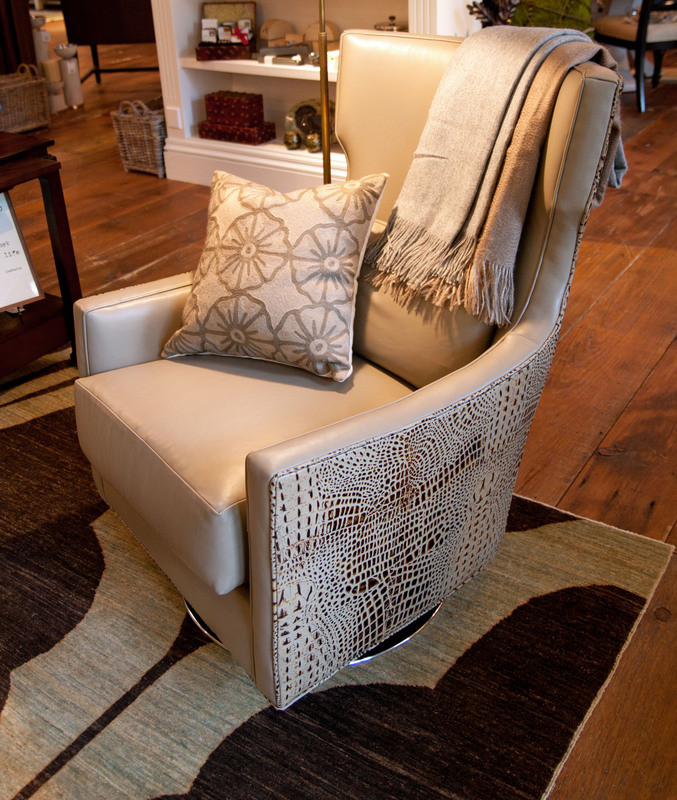 Patche: One of my favorite pieces is the wing chair. 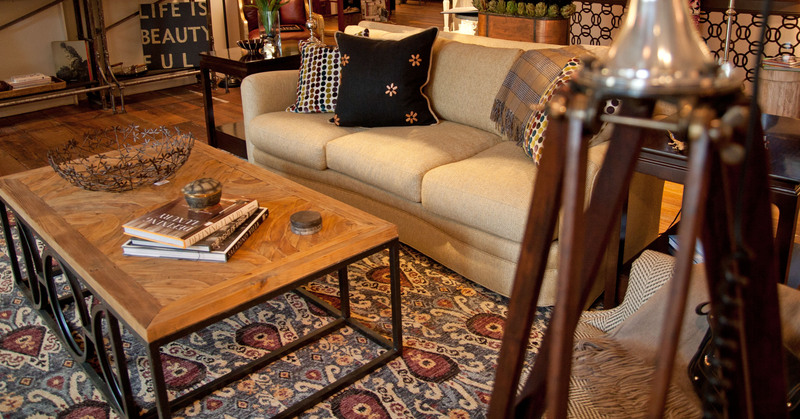 I like the clean lines of the piece with the masculine tweed fabric and the polished nickel nail heads. 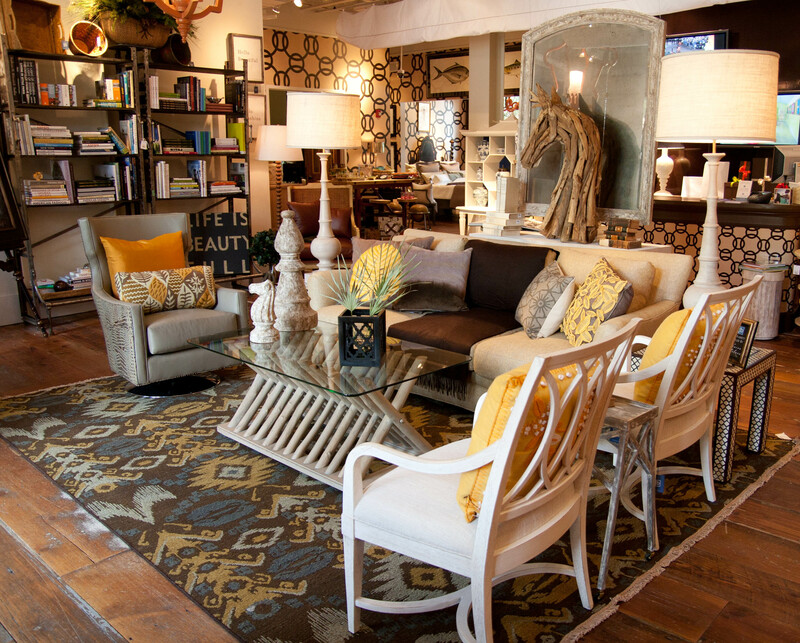 The chair pairs well with the clean lines and finish on the lamps as well. 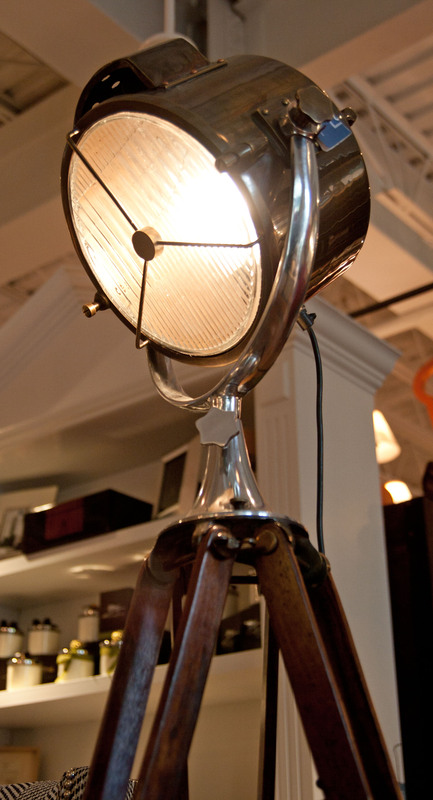 My other favorite is the Coast Guard spotlight lamp with the tripod wood base and leather accents. You always need an unexpected conversation piece to give a room character. 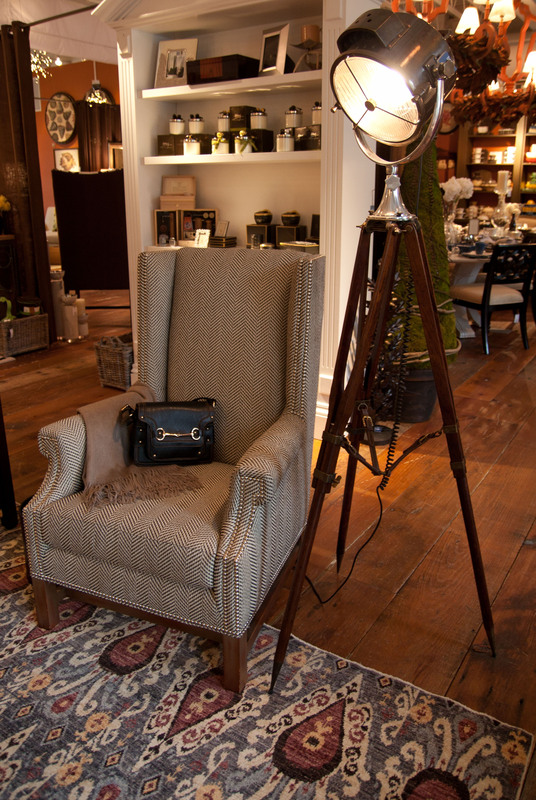 We love Patche’s cool lighting choices and great use of texture. Keep following our blog to see more designer interpretations and check out our previous white sofa designs by Deb Van Plew, Hannah Fulton ,Cindy Munn, Adrienne Warner and Shelley Wilkins. Shelley: The porcelain lamps. I love the silhouette. They are a great size and the rectangular shade allows them to fit almost anywhere. 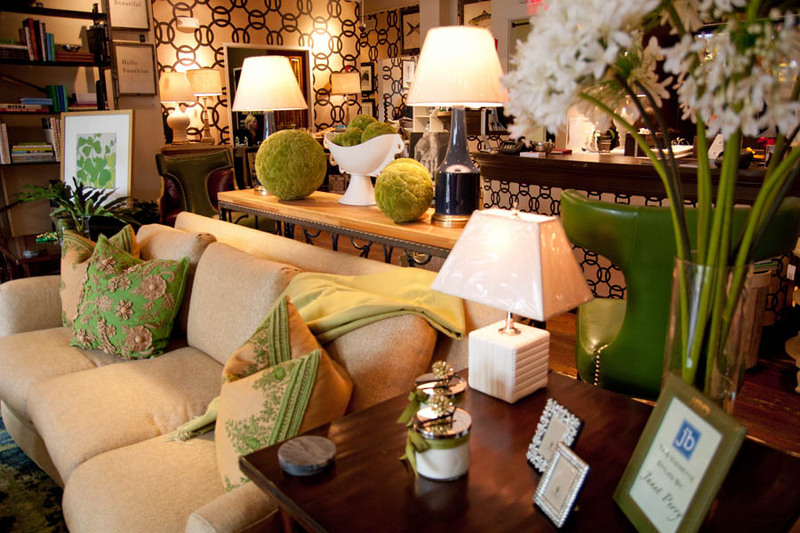 I also love the color of the lamps. The porcelain is crackled and they are the perfect tea stained color. JB: Can you tell us a little bit about your color choices and the emotions or feelings you wanted this space to convey? 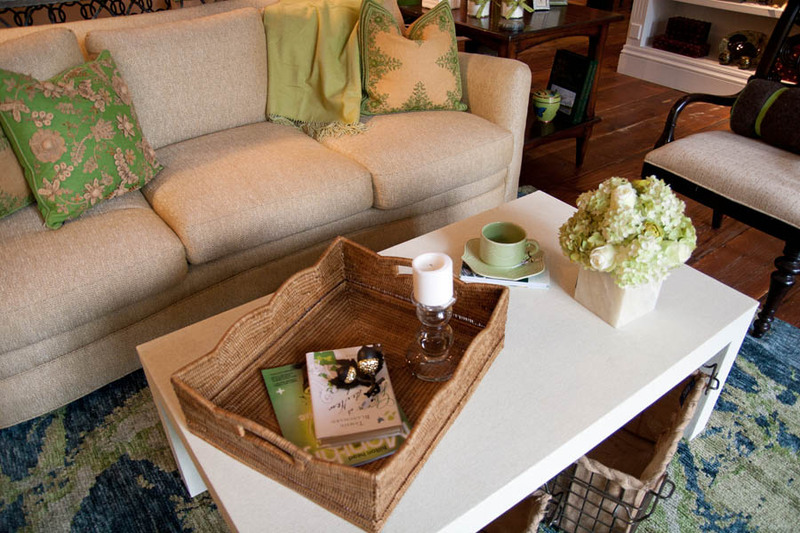 Shelley: I chose more neutral colors….greens, golds, and browns which all help this vignette convey a sense of calmness. 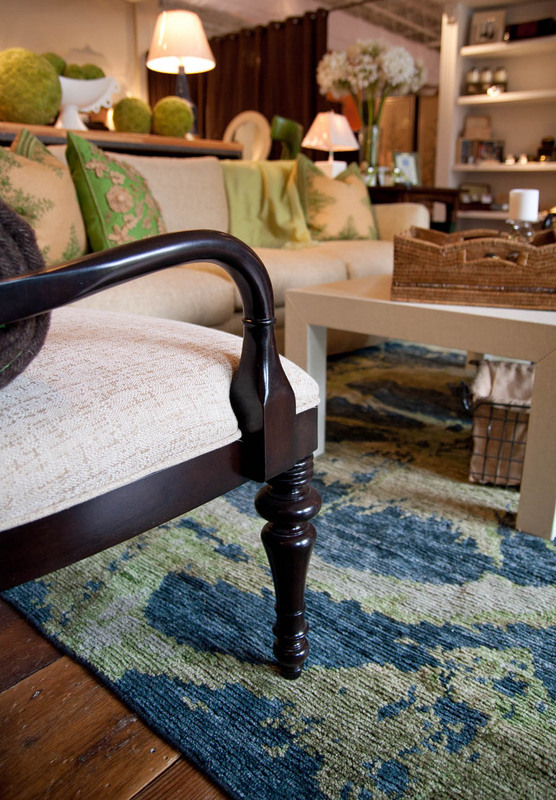 The colors are more natural and organic…very comfortable and quiet. The natural wood top on the cocktail table and the caning on the chair also bring in an undisturbed feeling. 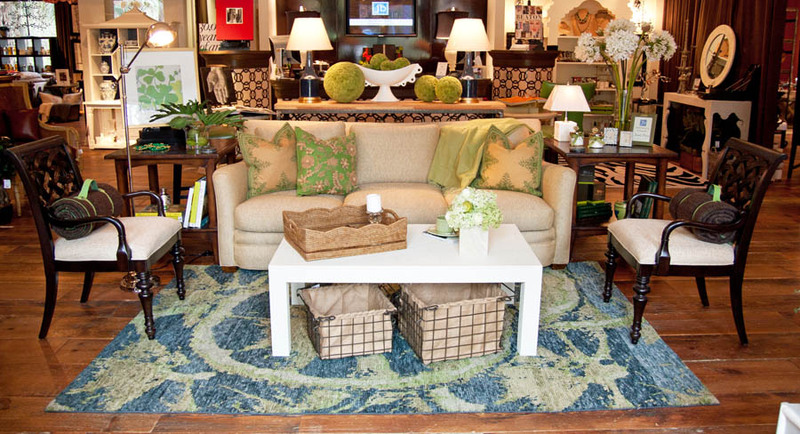 Shelley: I always try to add greenery to a room. It brings life into the space. 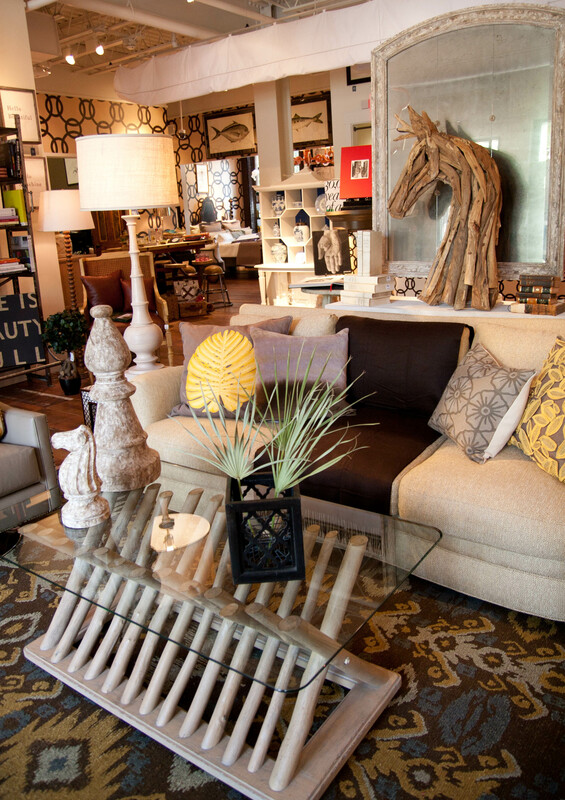 JB: What is important to consider when selecting accessories for a room? Shelley: Scale! 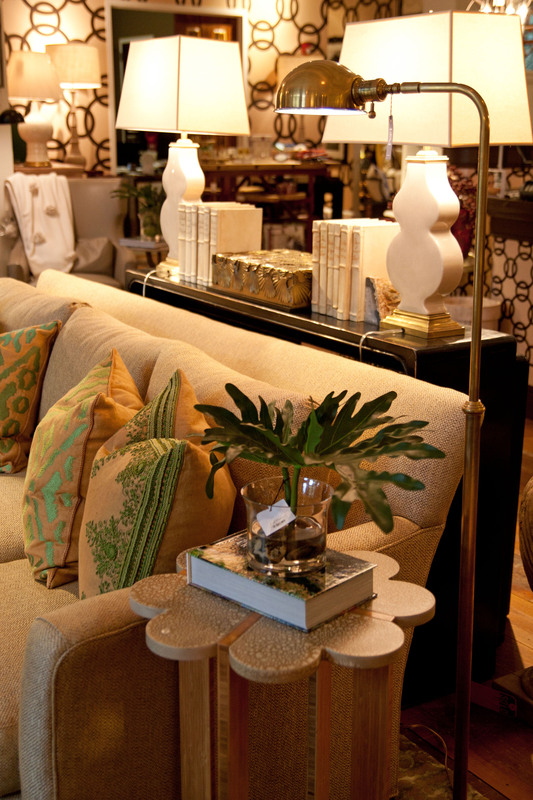 I feel that lamps and accessories have to be the right scale and proportion. Many people struggle with scale. 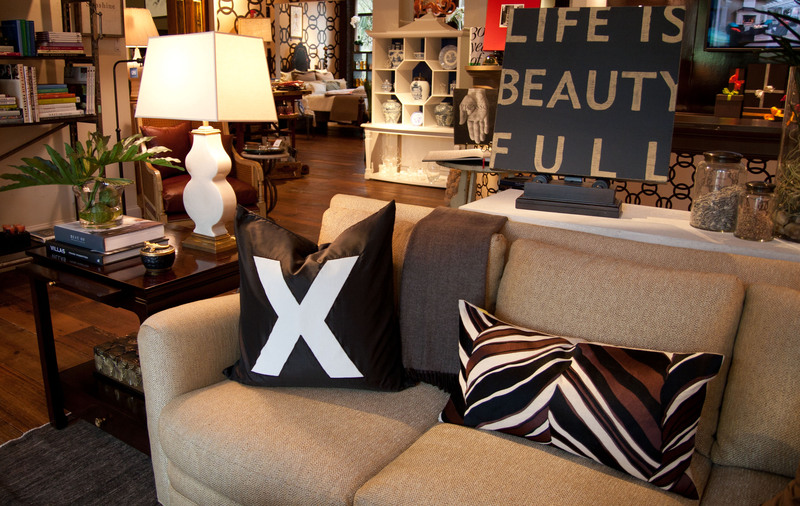 Lamps need to be a large chunky size, as well as the accessories …and less is more. It helps keep a space from feeling cluttered. 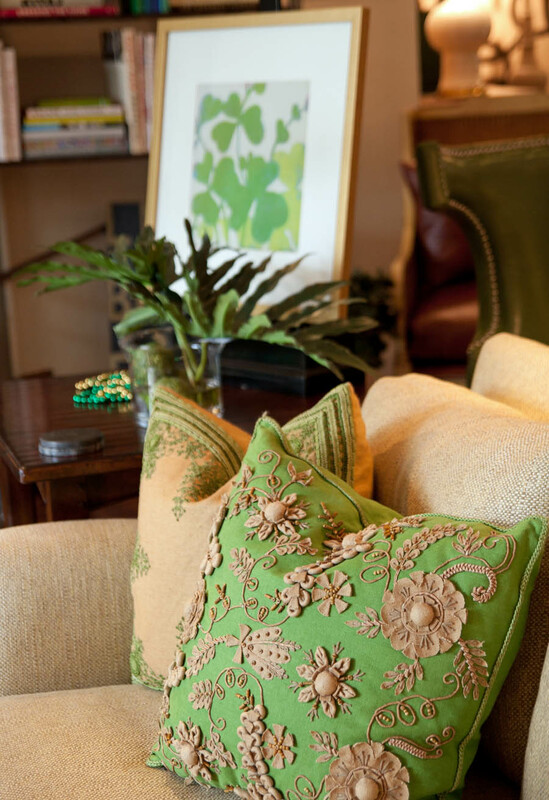 Shelley: I love this hand embroidered pillow. 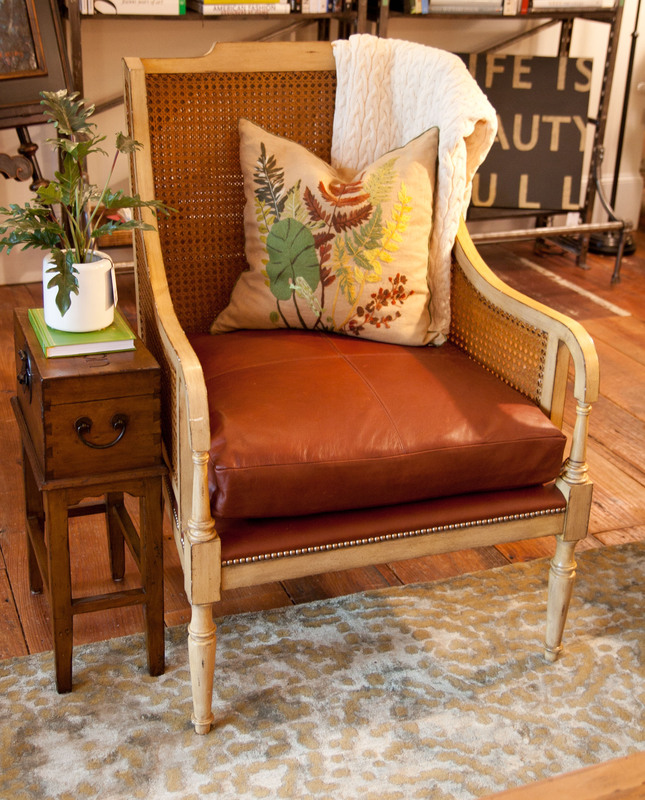 It’s a simple addition that warms up the leather chair. I also feel that every sitting area needs a throw blanket. 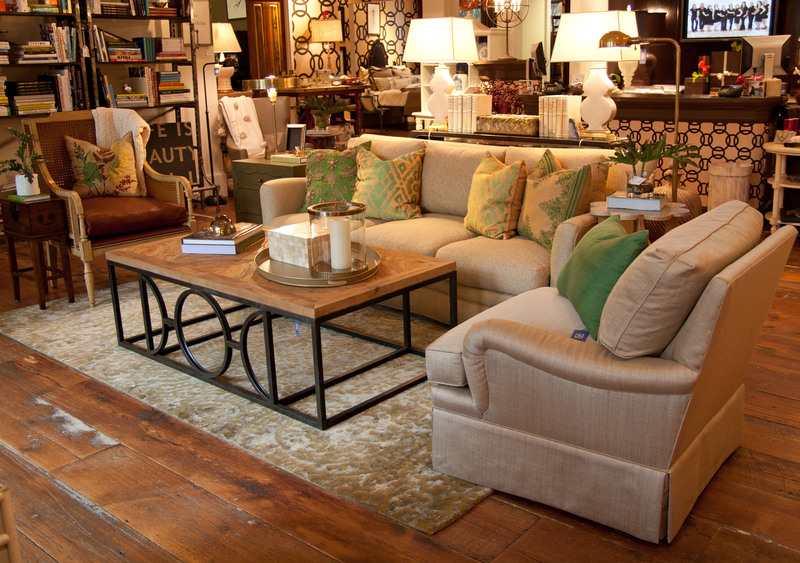 This is perfect for curling up and reading a book. 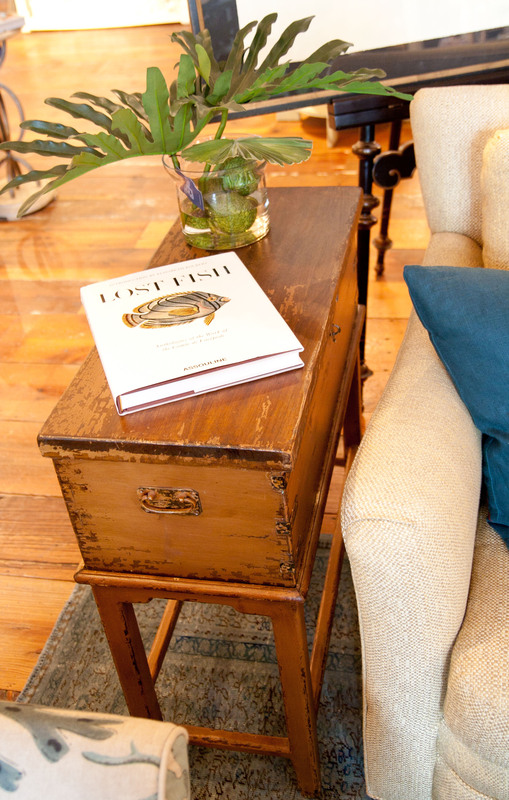 Shelley: I love the carved detail and texture on this chest. It is wrapped in a deep green grasscloth and then lacquered with a clear finish. JB: We love things that have an unexpected shape. 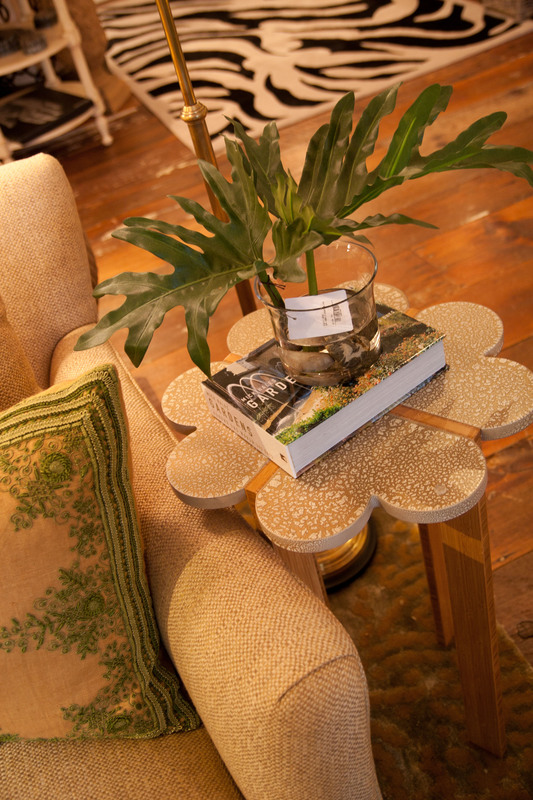 This clover shaped side table is a great example. 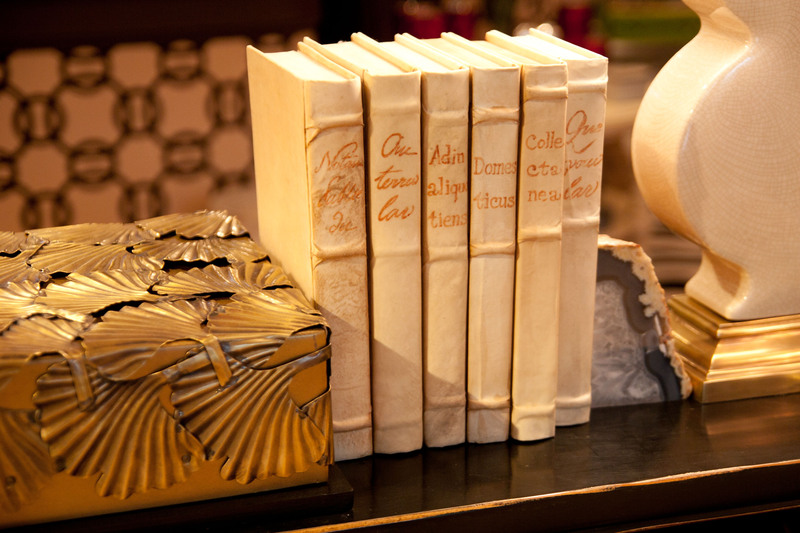 Shelley: I also loved these monochromatic spined books. 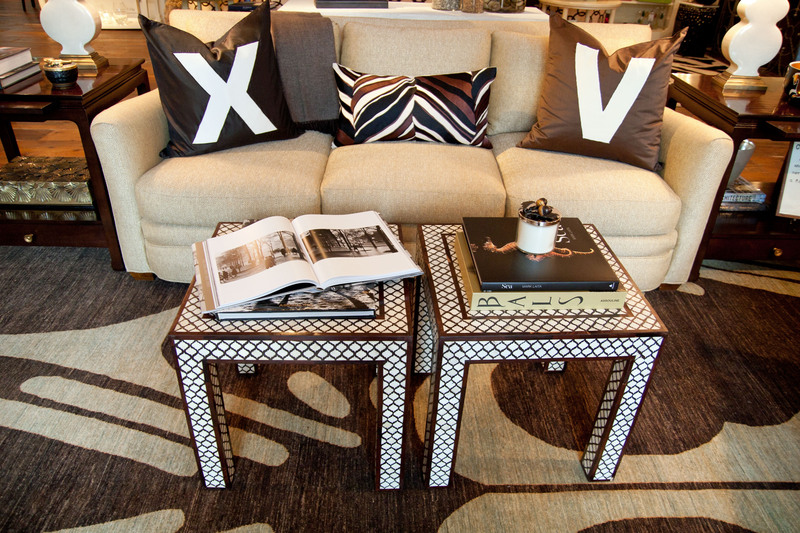 The matching color allows them to look more sophisticated and less cluttered. Keep following our blog to see more designer interpretations and check out our previous white sofa designs by Deb Van Plew, Hannah Fulton ,Cindy Munn and Adrienne Warner. 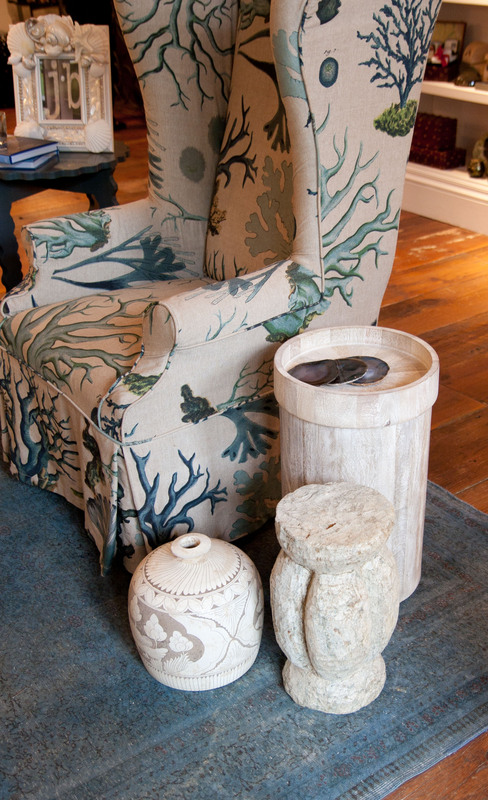 Adrienne Warner designed the latest vignette. We asked her a few questions about her accessory selections. 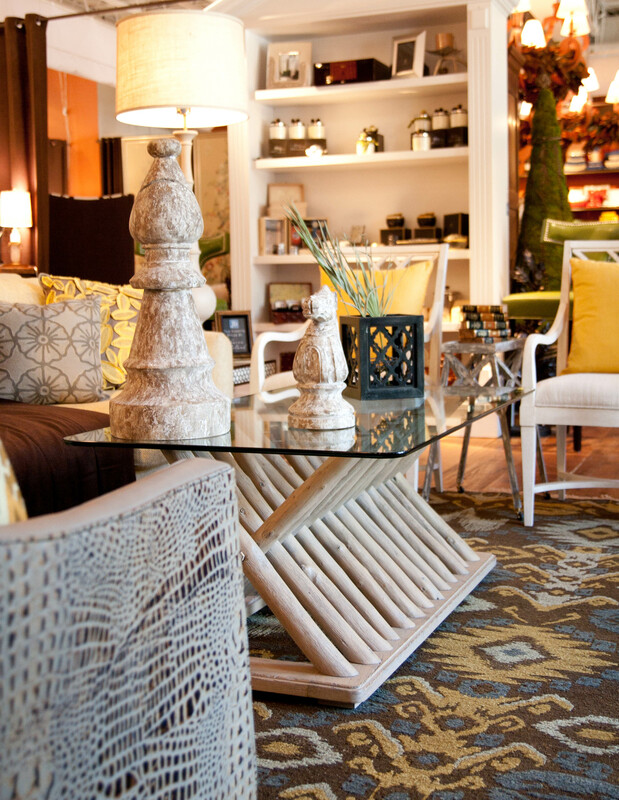 JB: What would you say is important to consider when selecting accessories for a room? Adrienne: Symmetry and balance. 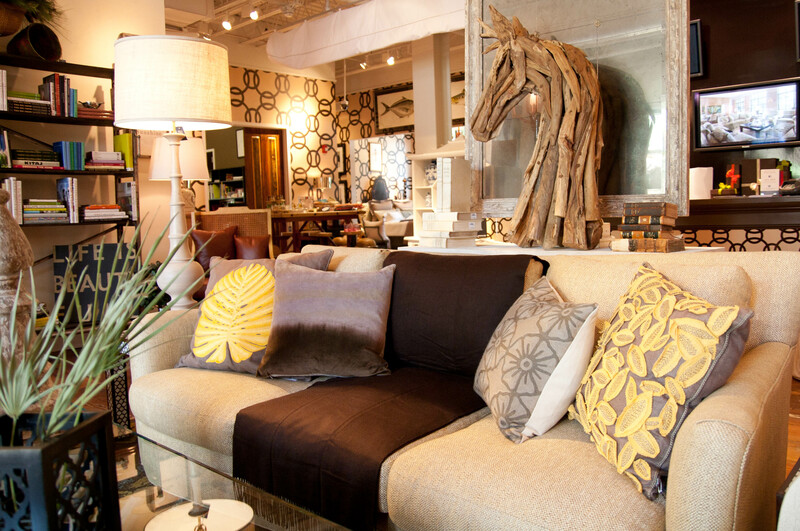 I usually start with larger elements like lamps or artwork first, then add layers with smaller items. 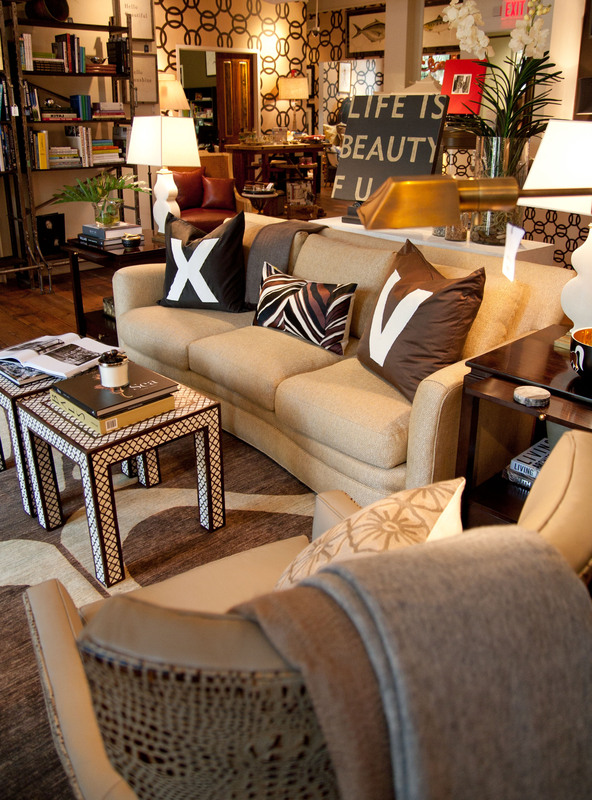 I think the best interiors are the ones that reflect the person and are a collection of their experiences and travels. You can’t be too concerned with sticking with a particular style. If an object makes you happy, you should find a special place for it. I like pieces that have a story and are unexpected. 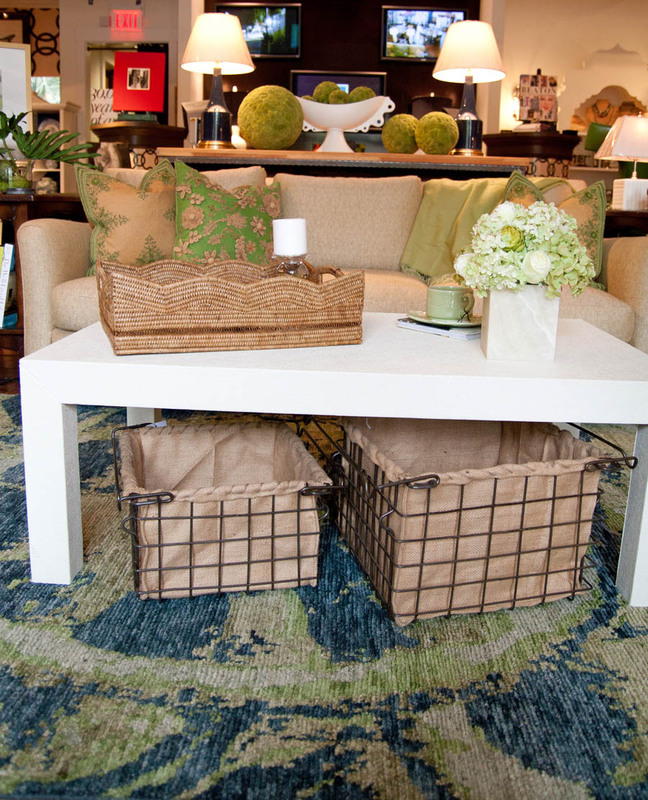 Adrienne: I love the two nesting tables used in place of a larger cocktail table. They can be moved around easily and used together or apart which provides a lot of flexibility. 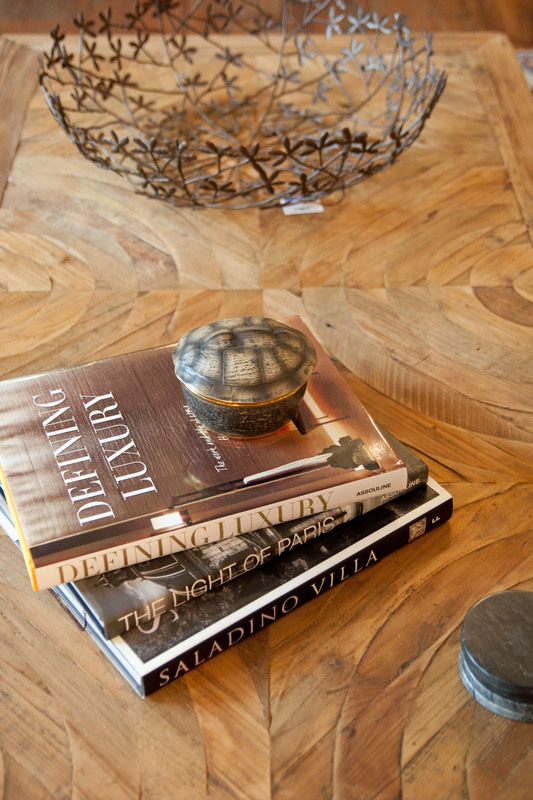 The inlay detail is really beautiful and adds a graphic element to the space which I really like. Adrienne: I also love the Van Plew Swivel Chair. It’s one of my favorite pieces in the J Banks Collection. 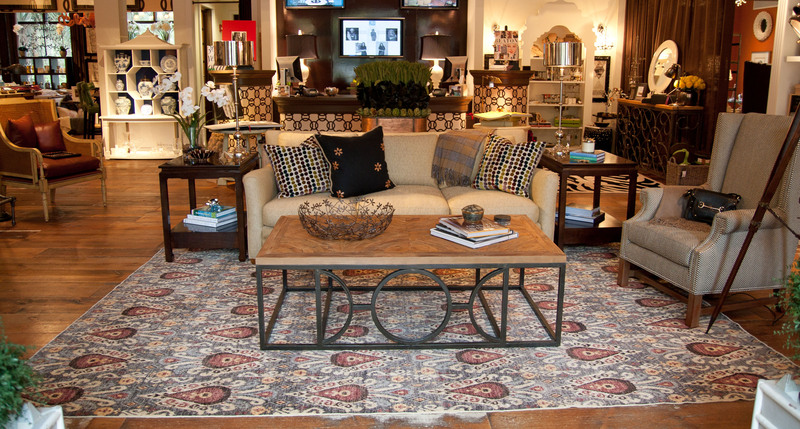 The crocodile leather adds a little funk and the color works really well with the rug. JB: Can you tell us a little bit about your color choices? 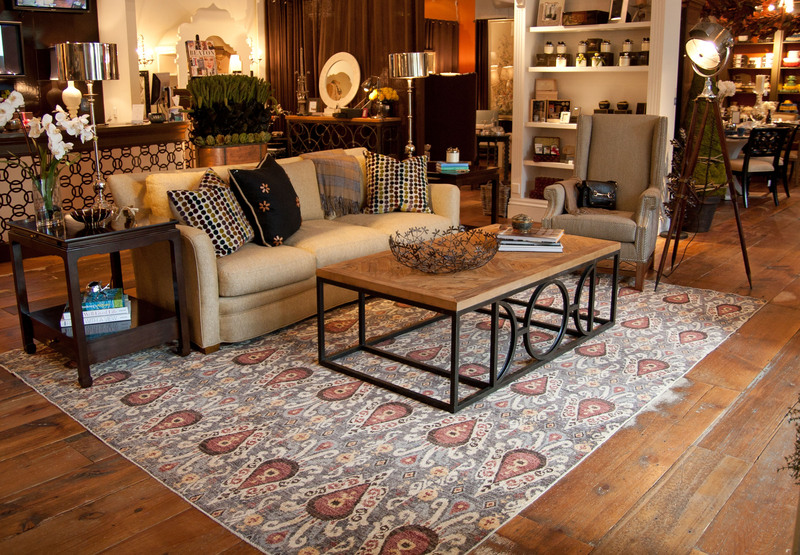 Adrienne: Everything started with the rug. 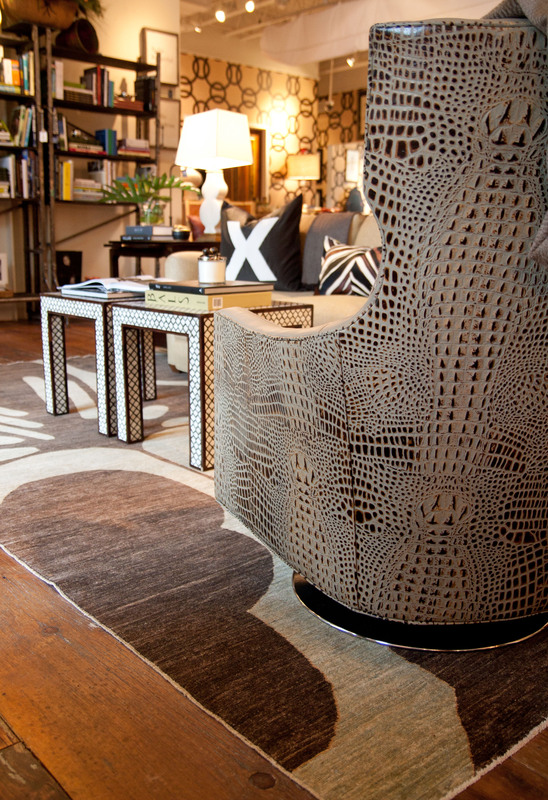 I fell in love with the over scaled, organic pattern. I think it’s contemporary but could be used in more traditional spaces as well. 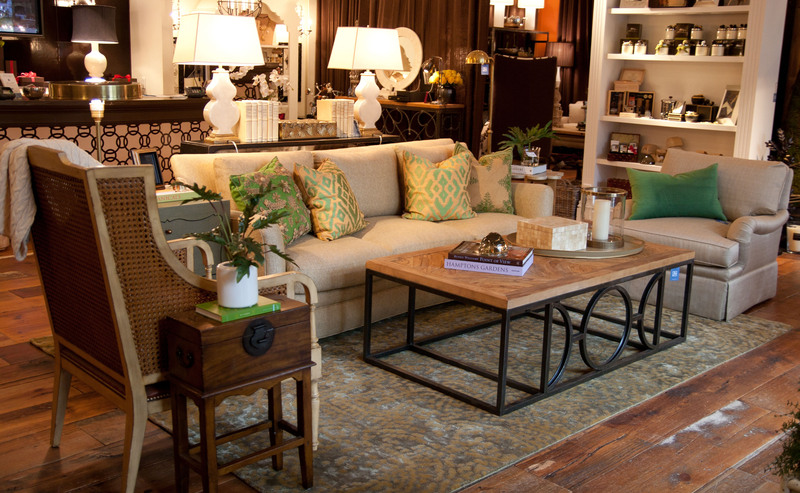 I like the warmth the side tables provide in the space, and the ivory lamps from Visual Comfort really pop against the darker stained finish. 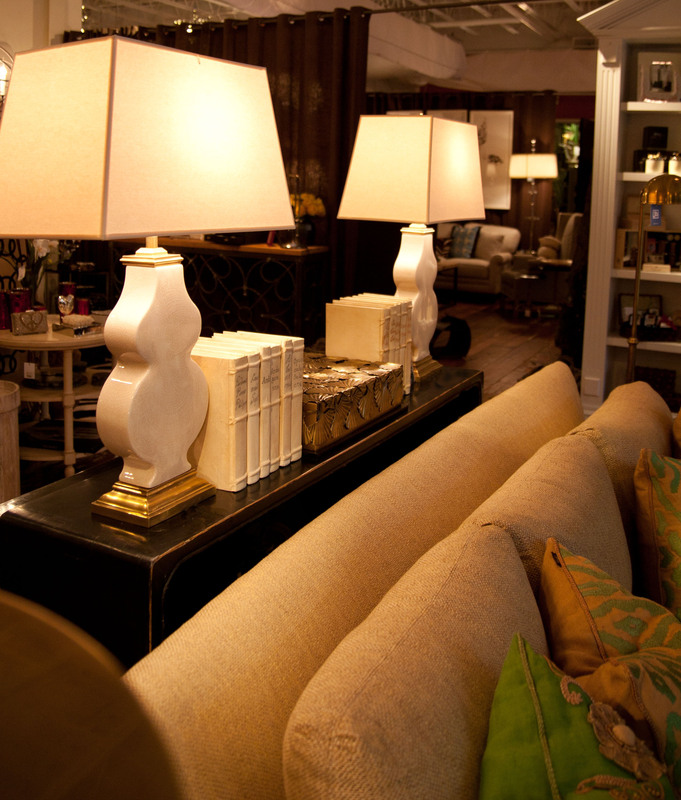 The gold detailing on the lamps also picks up the hardware on the tables. JB: What emotions or feelings did you want this space to convey? 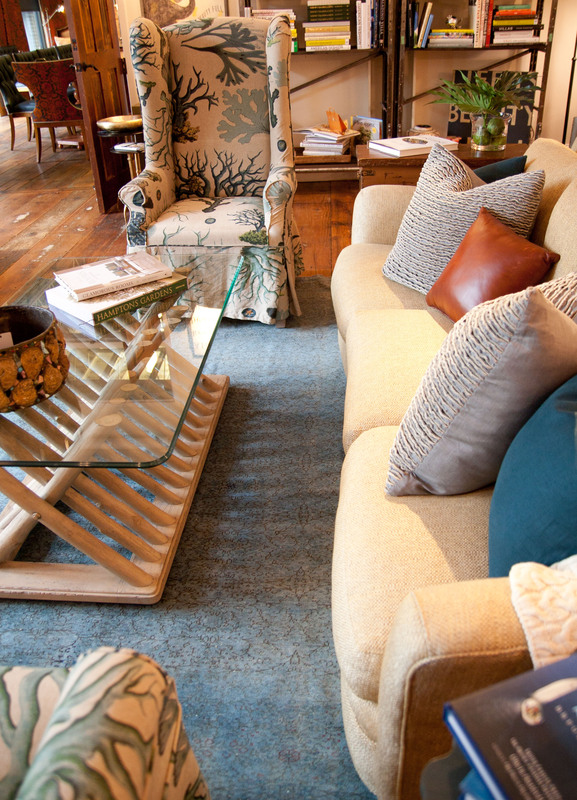 Adrienne: I’m drawn to spaces that aren’t too serious and make people feel comfortable. 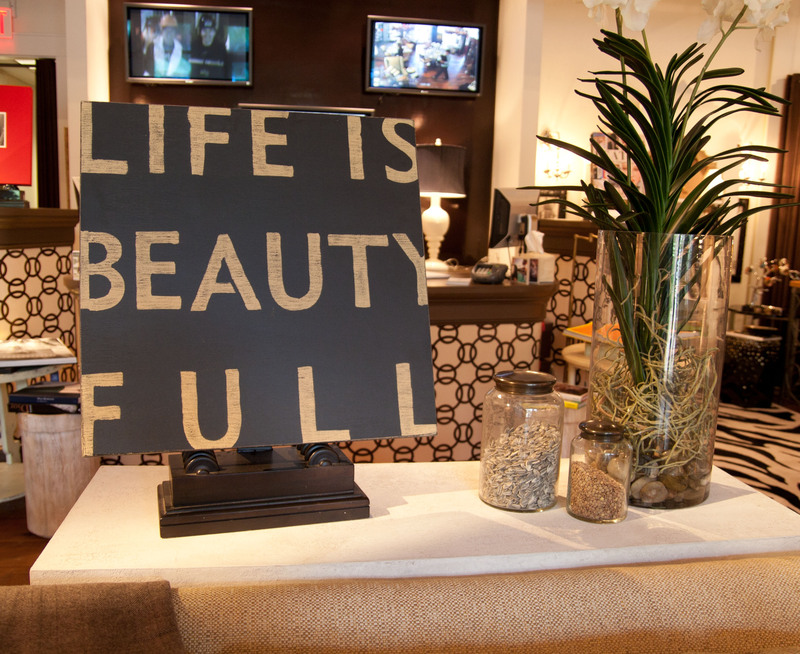 The “LIFE IS BEAUTY FULL” artwork behind the sofa makes me happy. DIY Tip: Fill glass canisters and vases with sunflowers, seeds, popcorn kernels, etc. 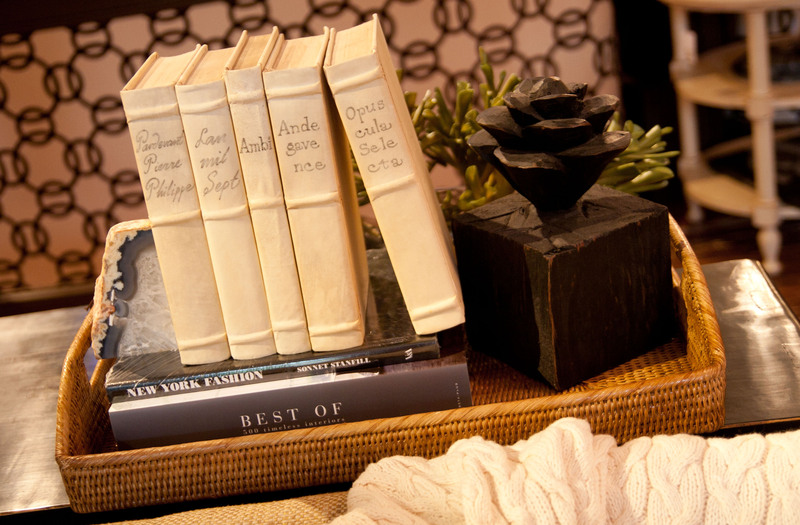 to add texture and color to a display. Keep following our blog to see more designer interpretations and check out our previous white sofa designs by Cindy Munn, Deb Van Plew and Hannah Fulton. JB: How would you describe the mood of your vignette? 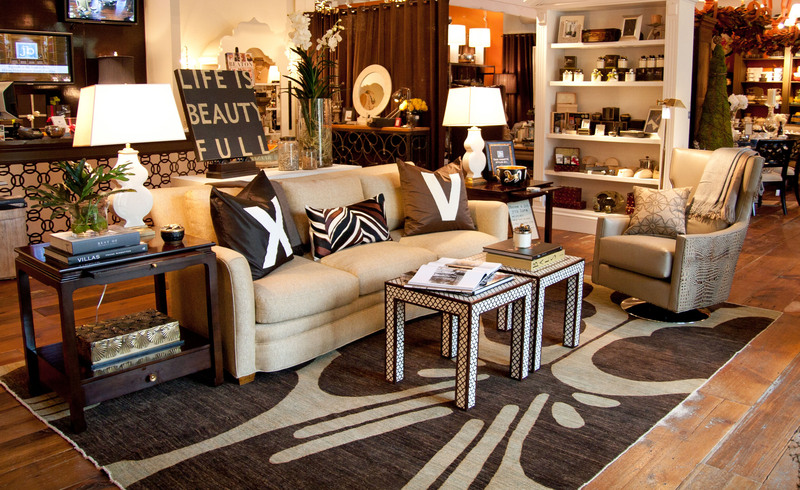 Cindy: This space has a casual sophistication. 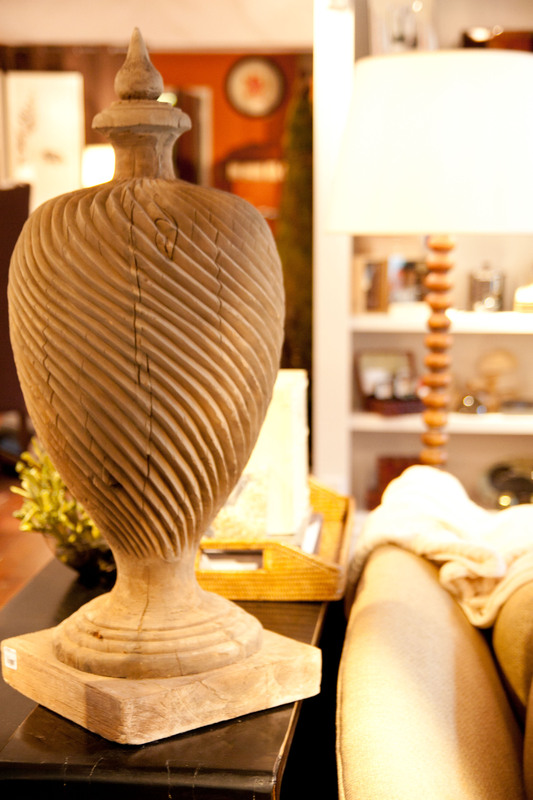 It is comfortable yet eclectic with found collectibles. JB: What can you tell us about your accessory choices? Cindy: As far as accessories go, I believe that less is more. I think that one or two really unique pieces will go far. 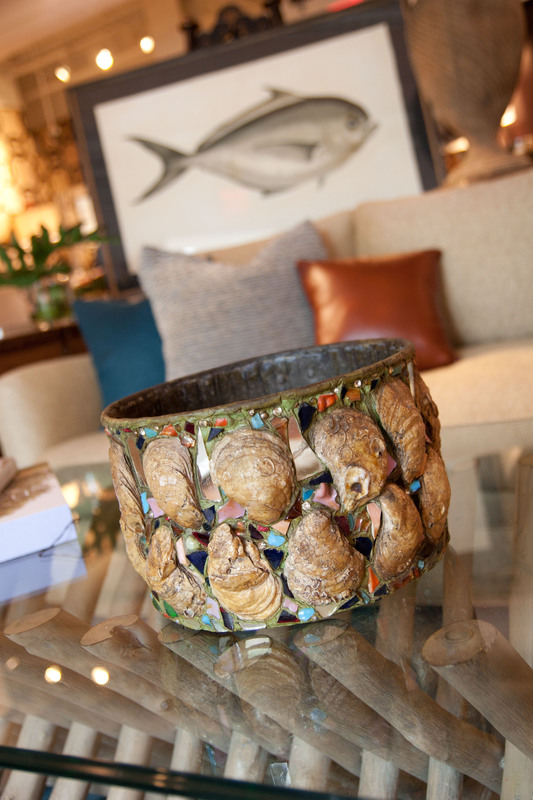 I love this antique oyster planter. It is a conversation piece. 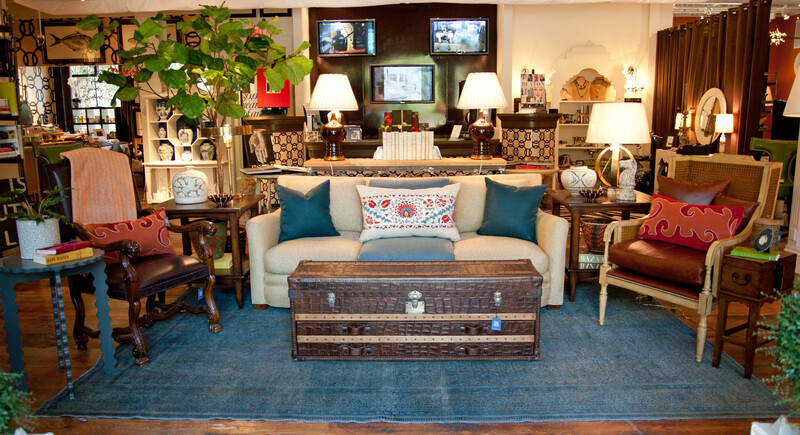 I like to mix the old with the new and bring the outdoor elements inside. Cindy: I wanted natural tones and colors. 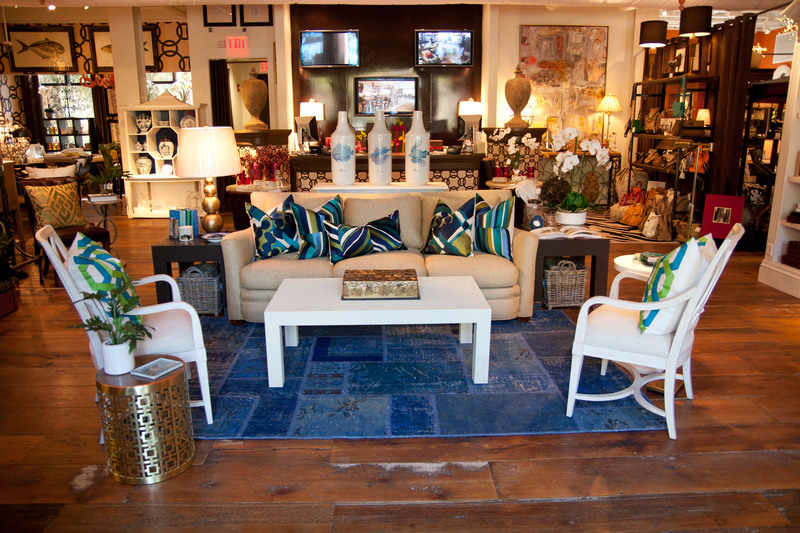 The natural linen on the chairs and the driftwood finish on the coffee table are nicely contrasted against the blues and are indicative of the sky and water surrounding our area. 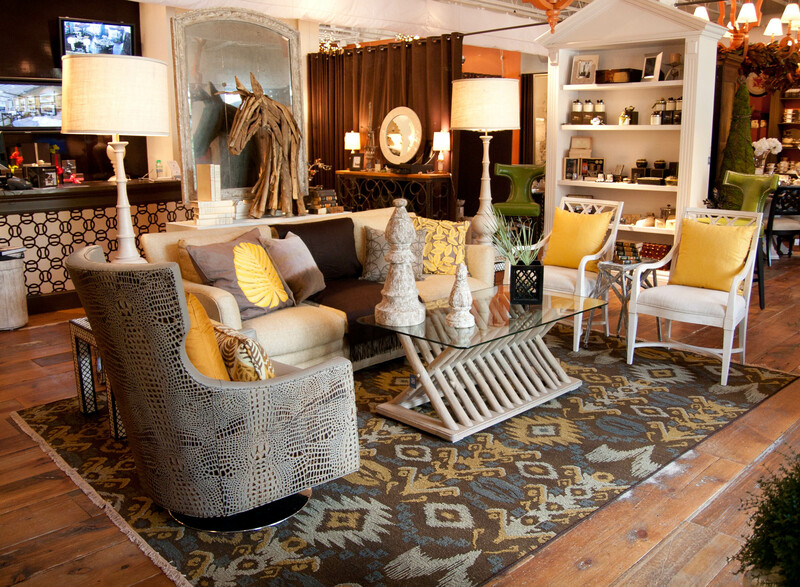 Cindy: My favorite items would have to be the chairs and the rug. 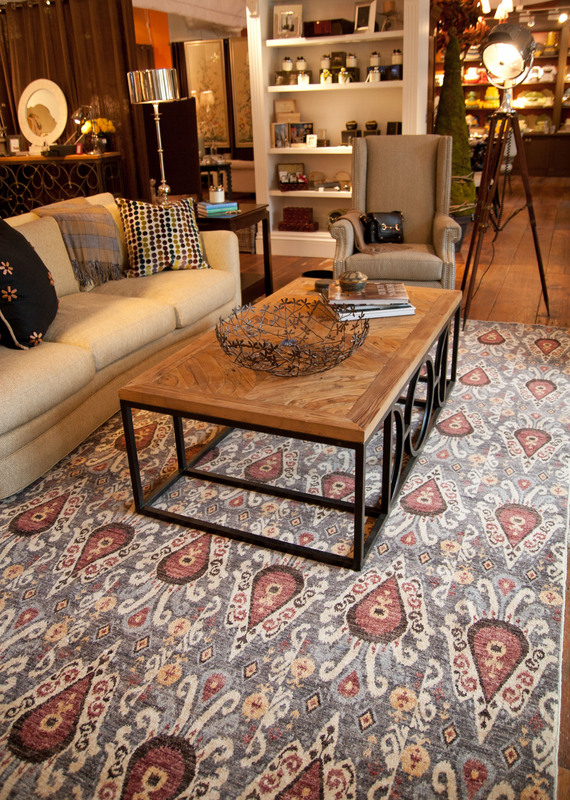 The rug is an over dyed Peshawar made to resemble an antique. 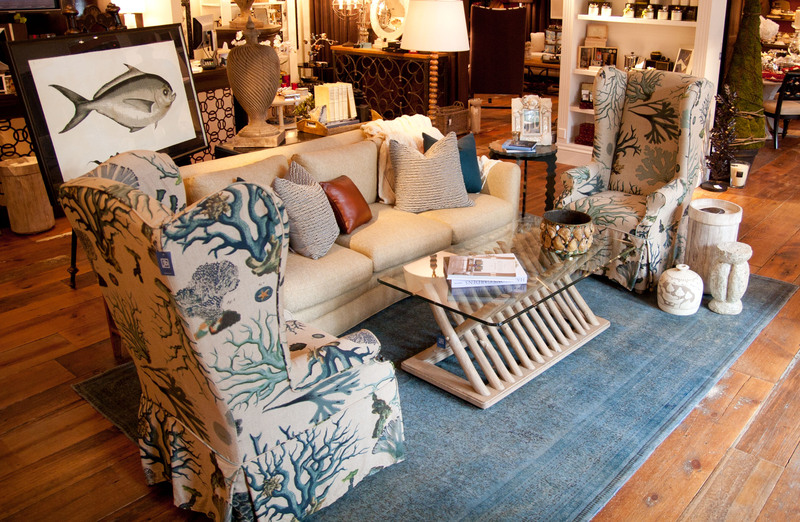 The scale, the fabric and washed linen slipcovers of the chairs really exhibit casual sophistication. 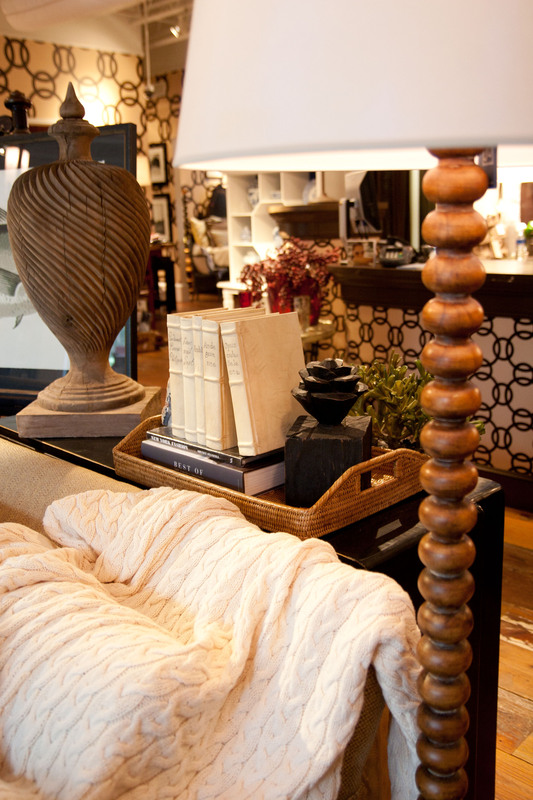 We love Cindy’s comfortably elegant vignette. Keep following our blog to see more designer interpretations and check out our previous white sofa designs by Deb Van Plew and Hannah Fulton.